The lady of the house had been asked to walk to work so that the arrival of the Tesco delivery would not be missed. She obliged and walked as she usually did; she is continuing in her efforts to reduce her rather large and bulky frame in readiness for going on the beach in her bikini in the summer. Now, of course, she has the added incentive of a wedding in the family in 2014. Shares in Slimming World will no doubt rocket over the next eighteen months! While waiting, Alfie and I had a great time playing together. 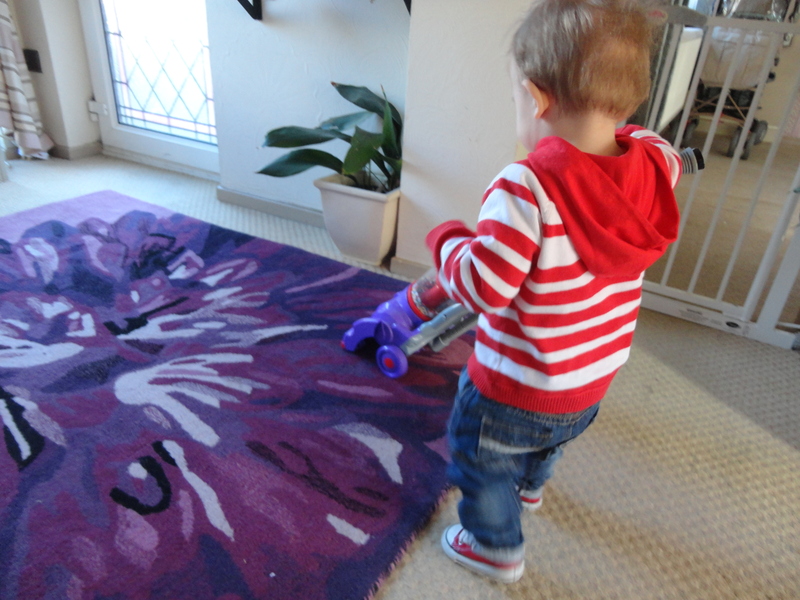 Alfie did a spot of hoovering, knowing I am sure, how much I love having a clean home. We played lots of games together and had great fun, but the best game of all was a new game Alfie invented after I changed the batteries in his mini dyson. We called it 101 Things to do with 4 dead batteries. That was real fun. I think we got to 64!! Annoyingly, Tesco did not come until just before ten, which meant we were cutting it fine to make breakfast down the Bay. We were both ready, so when the stuff was away in the cupboards, we were in the car and off. 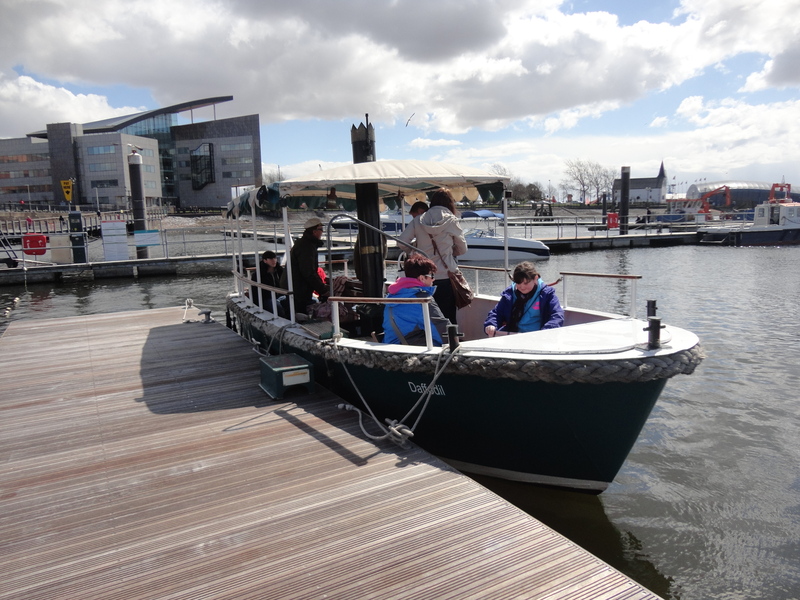 Cardiff Bay was our first stop; it was a bright sunny morning, although a north- west wind did make it feel rather chilly. Cardiff Bay used to be called Tiger Bay for many years. 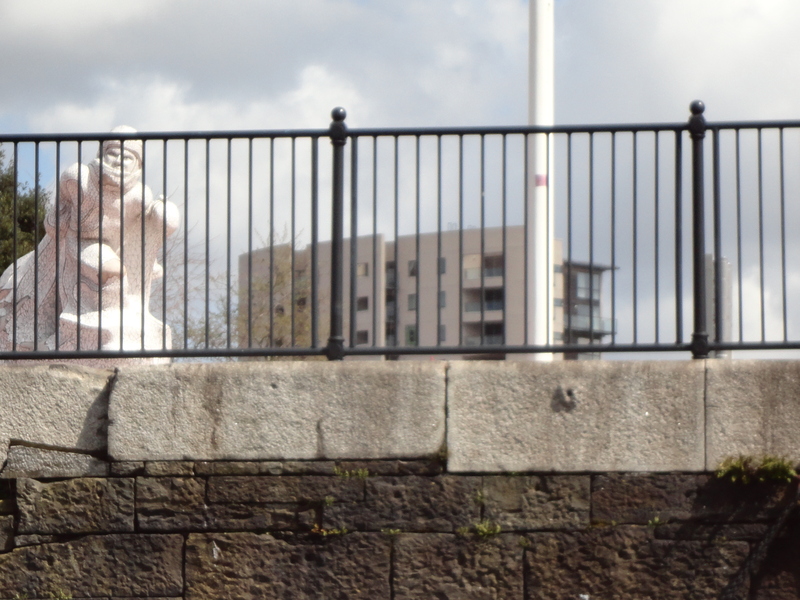 Tiger Bay was the local name the area of Cardiff, which covered Butetown and Cardiff Docks. 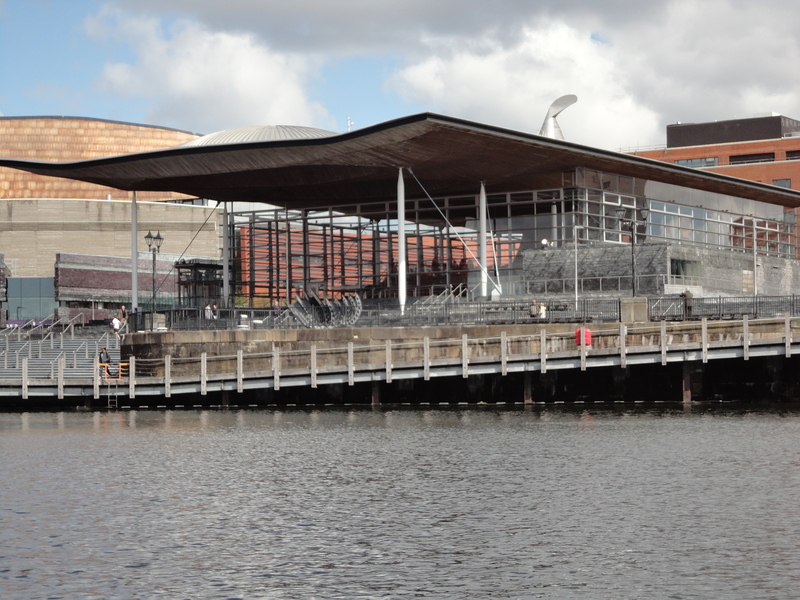 It was re-branded as Cardiff Bay following the building of the Cardiff Barrage, which dams the tidal rivers Ely and Taff to create a huge freshwater lake. As Cardiff’s coal exports grew in the nineteenth century, so did its population. Dockworkers and sailors from across the world settled in neighbourhoods close to the docks, known as Tiger Bay. The name Tiger Bay was the nickname sailors gave it due to the fierce currents around the local tidal stretches of the River Severn, as they sailed into Cardiff Docks. Migrant communities from up to 45 different nationalities helped create the unique multicultural character of the area, long before Tony Blair had the idea. Tiger Bay had a reputation for being a tough and dangerous area. Merchant seamen arrived in Cardiff from all over the world, only staying for as long as it took to discharge and reload their ships. 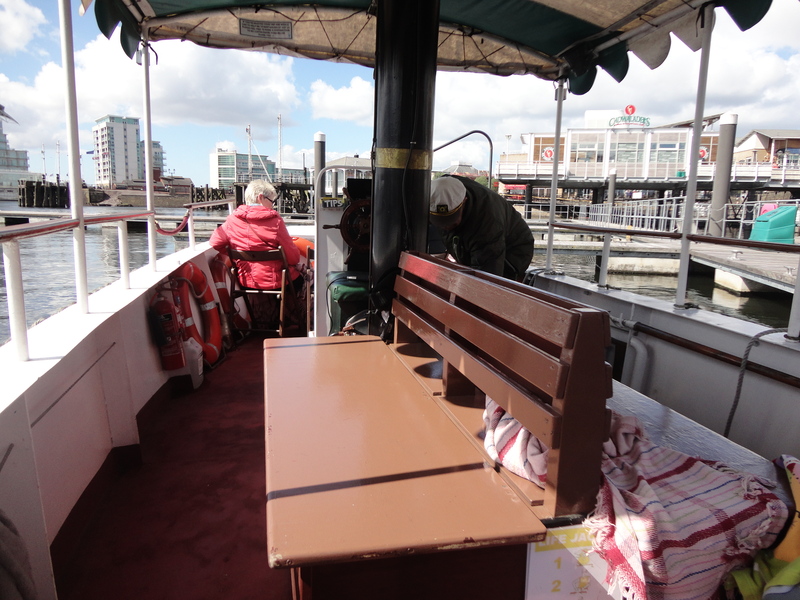 Consequently the area became the red-light district of Cardiff, and many murders and lesser crimes went unsolved and unpunished, the perpetrators having sailed for other ports. However, locals who lived and stayed in the area describe a far friendlier place, with a strong community spirit and sense of belonging. My mum grew up in Tiger Bay, in a fish and chip shop in Sophia Street, right at the very heart of things. The fish and chips she served were known all over the world, as sailors returned home and spoke of their time in Cardiff. I managed to find a parking space right outside the world famous Coal Exchange Building, where the world’s first one million pound cheque was used. It has lost some of its former glory now but still has an air of grandeur. 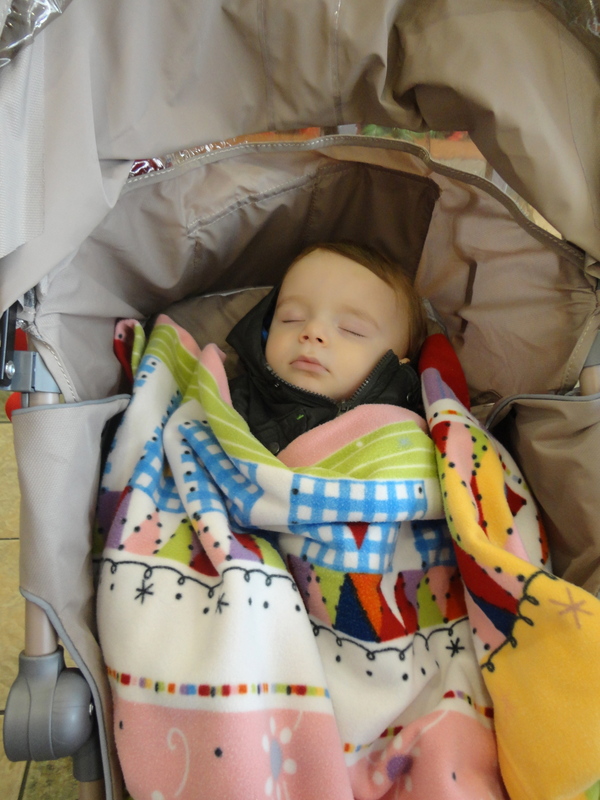 I noticed Alfie had fallen asleep just after we left home, that early morning was catching up with him and he didn’t even wake when I parked and transferred him to the pushchair, it would be a quiet start to todays’ adventures. I made Subway just in time to get the £2 breakfast deal. Oats and honey roll with egg and bacon with a cup of coffee… gotta be right! I ate it alone but appreciated being out in the Bay. It was not busy and the wind was colder than I imagined, but it was still a great place to be. I checked my mail and my Facebook page and my little friend who was sleeping soundly by my side. After breakfast I strolled around the Bay for a while, loving every second. We passed a boat owner shouting out a message trying to draw customers to a twenty-minute boat ride around the harbour. He must have seen me coming because he started shouting that OAPs were welcome and buggies could be brought safely on board and kids were free. 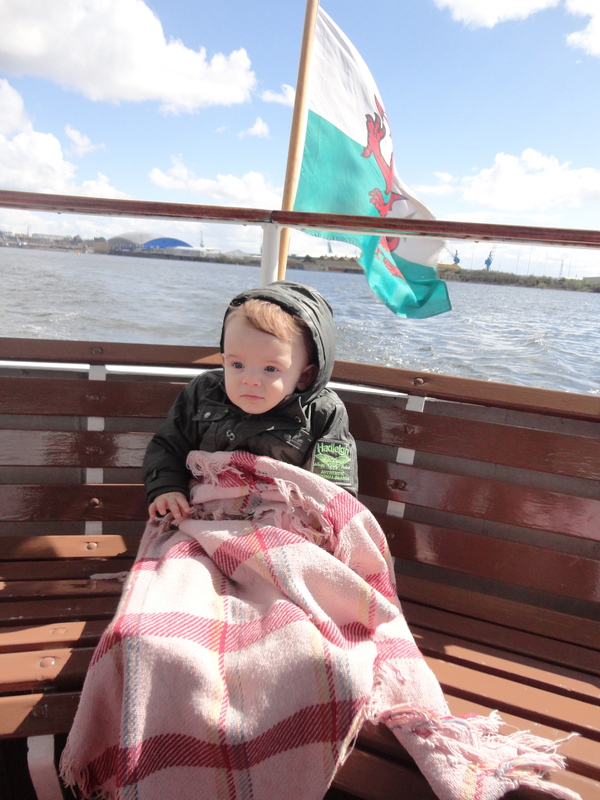 I quite fancied it but Alfie was asleep… or at least I thought he was but when I looked he was smiling and pointing to the man, I took it as a sign and we made our way down to the boat, both smiling now. The owner had a ships captain’s hat and the gift of the gab for sure. We got on and Alfie sat next to me in the rear of the boat. We made use of the blankets to keep us warm and we set off. We were ordered to call him Captain, even though his boat was small and reminded me of the African Queen in the old Humphrey Bogart film. It had a funnel up through the middle and vibrated rather a lot. Alfie loved it. 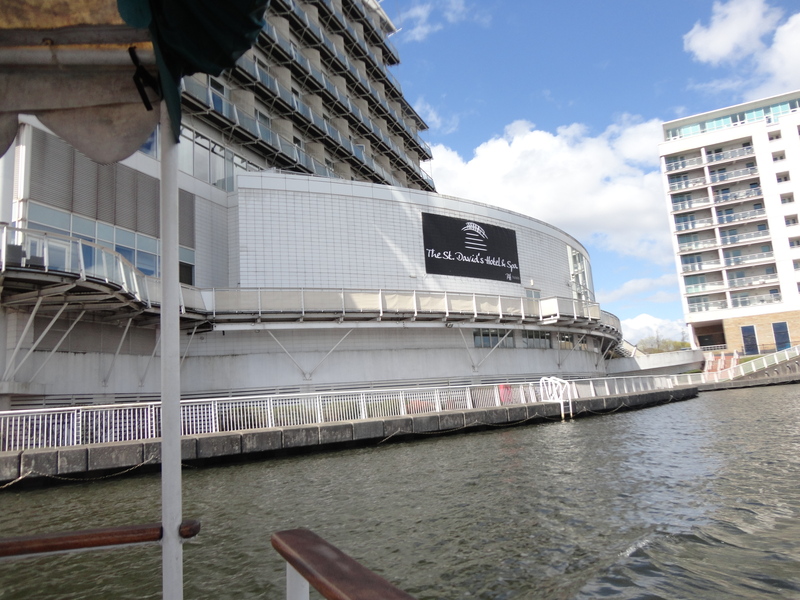 We sailed out into the Bay passing quite close to The St David’s Spa and Hotel in case “the rich people throw some money out of the windows” … but not a single penny came our way. The captain gave a running commentary as we sailed. He reminded me of an old wag who took us on a tour of the coast near Cannes in the south of France. That guy claimed he knew Joan Collins and when he tooted his horn; a window of a house on the shore opened and a hand waved a handkerchief, supposedly the hand of the aforesaid lady. We still smile when we think how good it must be to know someone famous! 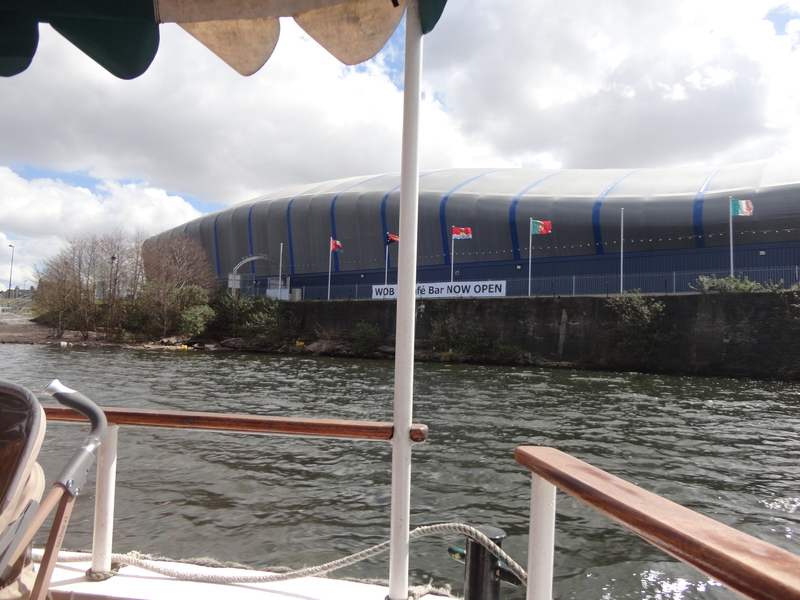 We were shown the new Dr Who Exhibition and the lock gate through which Captain Scott left to go to the South Pole. 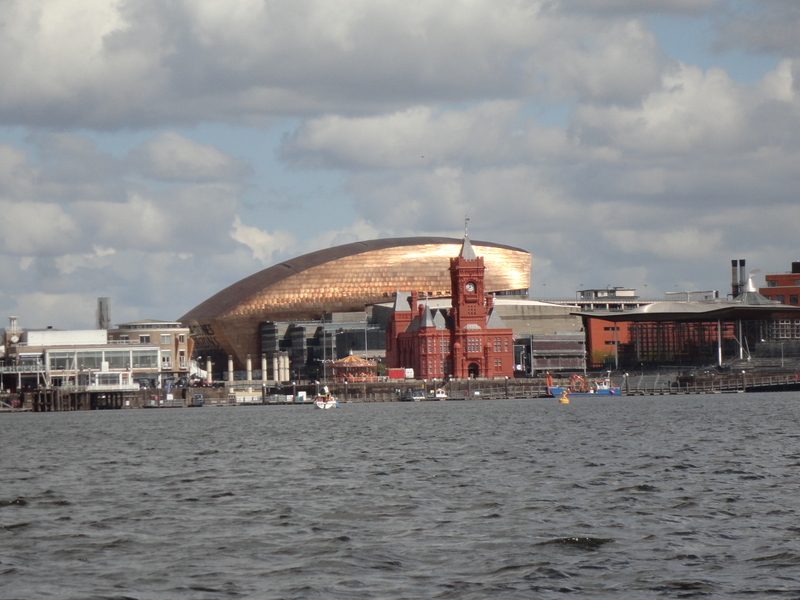 Looking back at Cardiff, the sun shone onto the Millennium Centre making it all look stunning. Cardiff is a great place to live; especially now we have a Premier League team here! 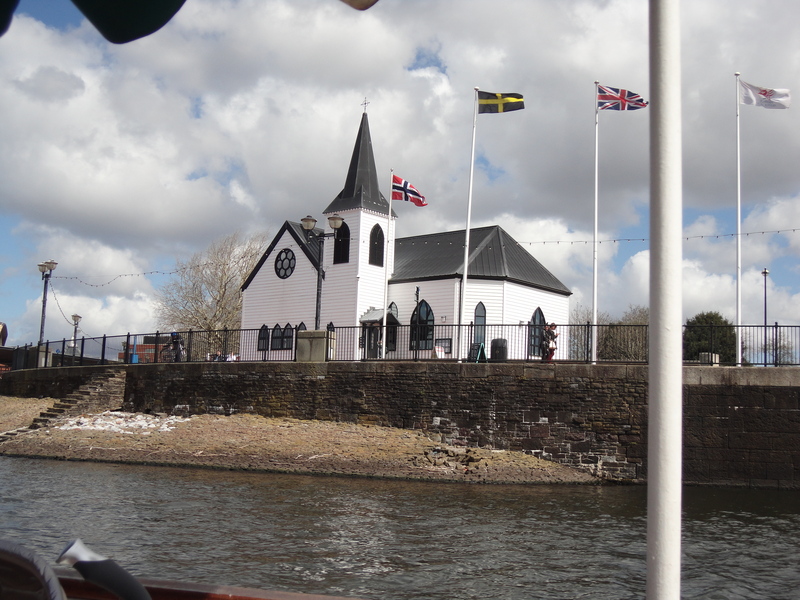 We also passed The Sennedd and the Norwegian Church and the captain was rattling on about Roald Dahl and how he was christened there. 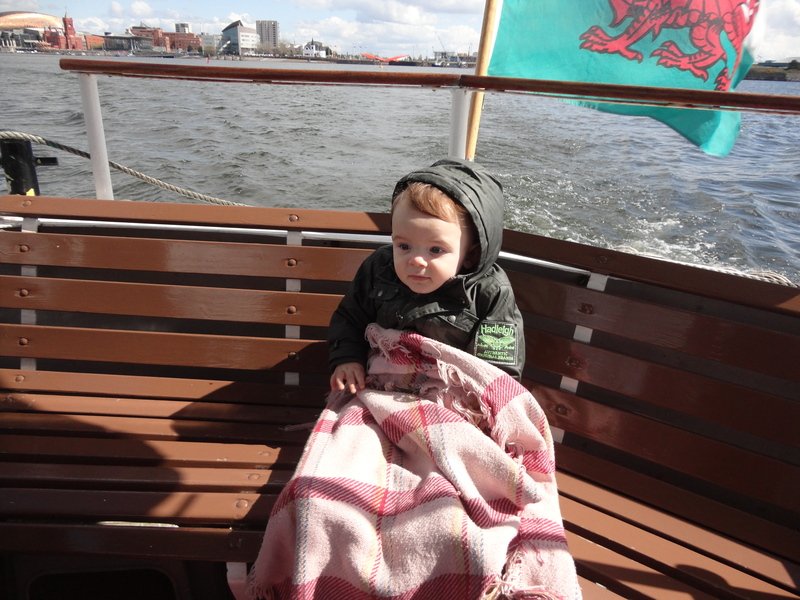 We got off the boat and strolled lazily back to the car and headed for Penarth. 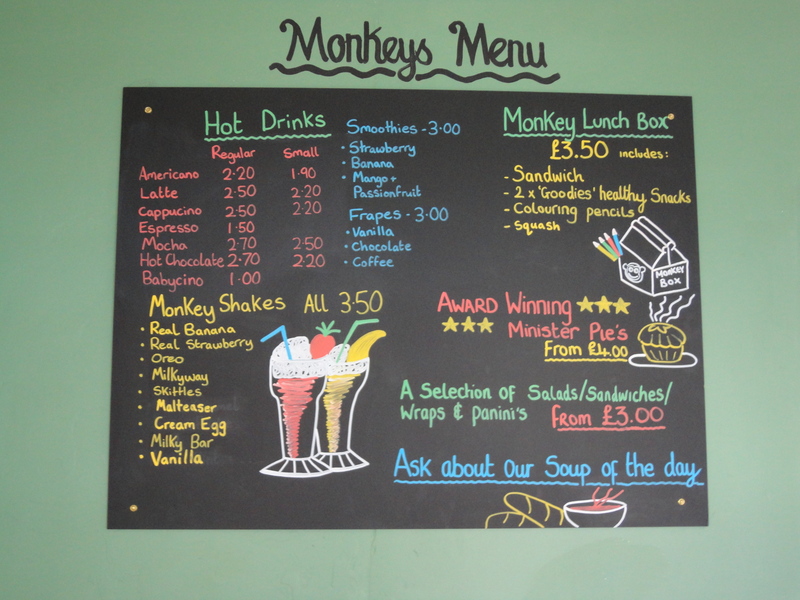 Little Monkeys Cafe aims to provide parents with a safe family friendly environment in which they can relax whilst their children have fun. We offer a range of child friendly activities throughout the week specifically aimed at children from 6 months to 6 years old. 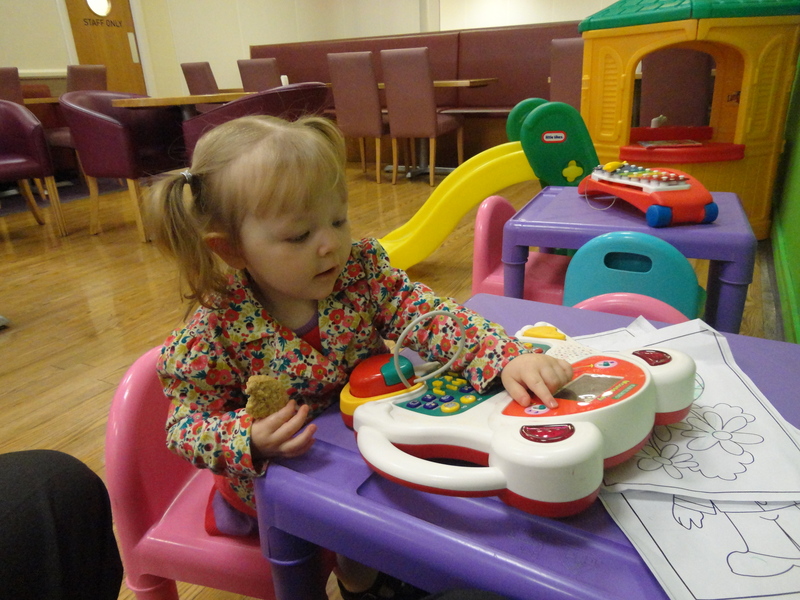 Each day is themed and our staff are guaranteed to keep your little ones entertained whilst you relax and enjoy some of the delights available at our cafe. 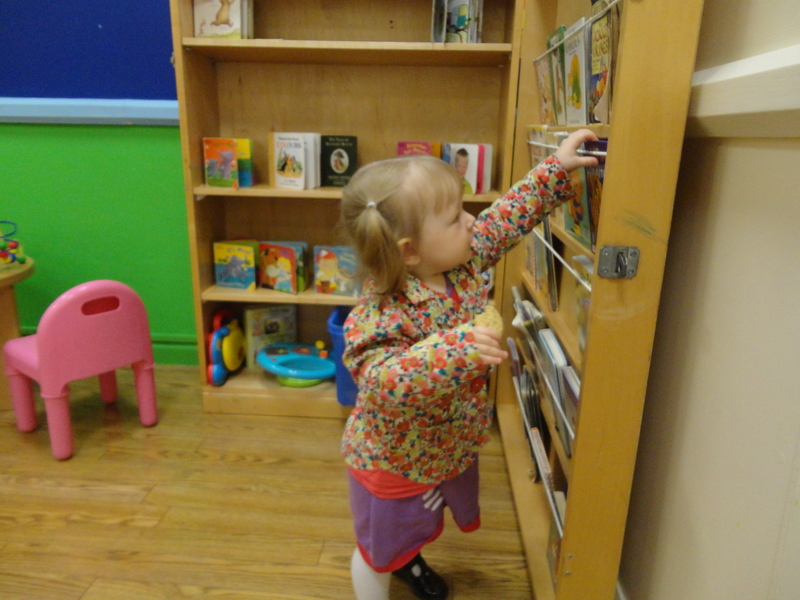 Want to join in too…Parents are more than welcome to join in all of our activities! 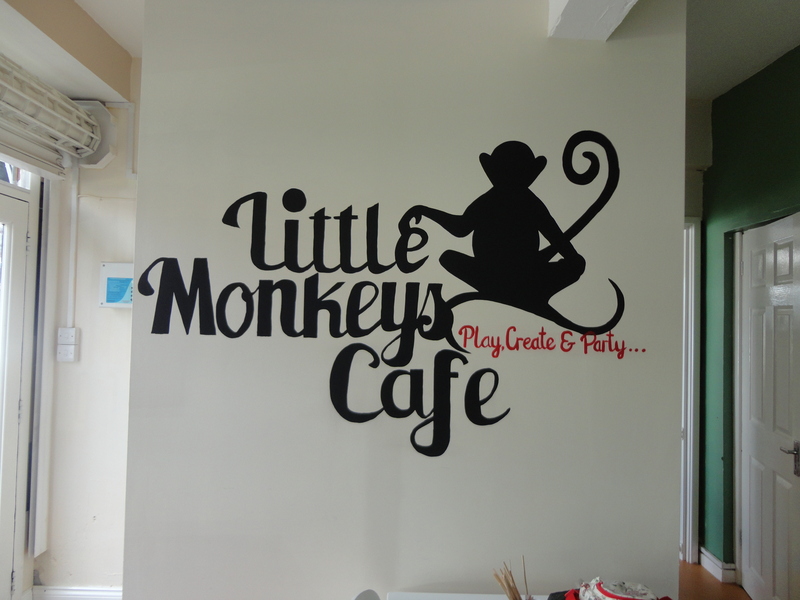 Little Monkeys Cafe is not a kid friendly Cafe, it’s a Cafe for kids. 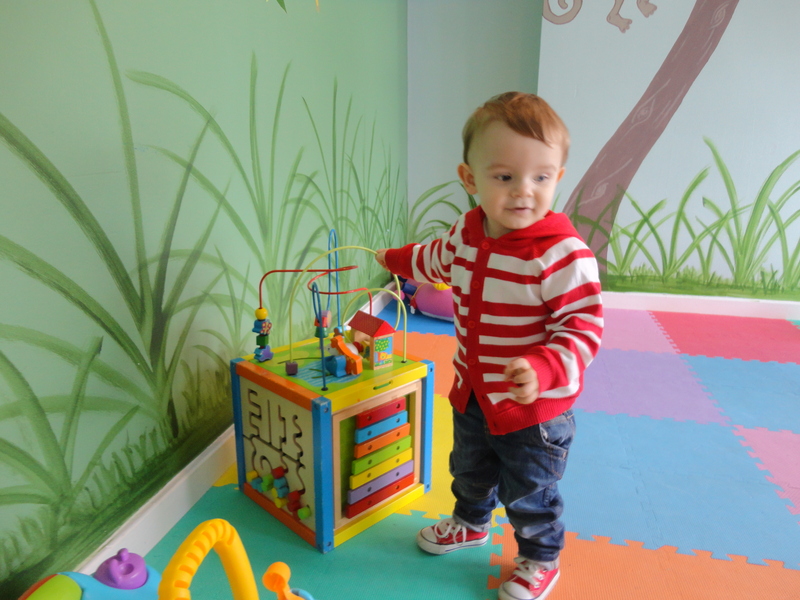 Everything we do places safety, development and fun as the first priority, we encourage noise and will do everything we can to ensure your little one gets to monkey around! 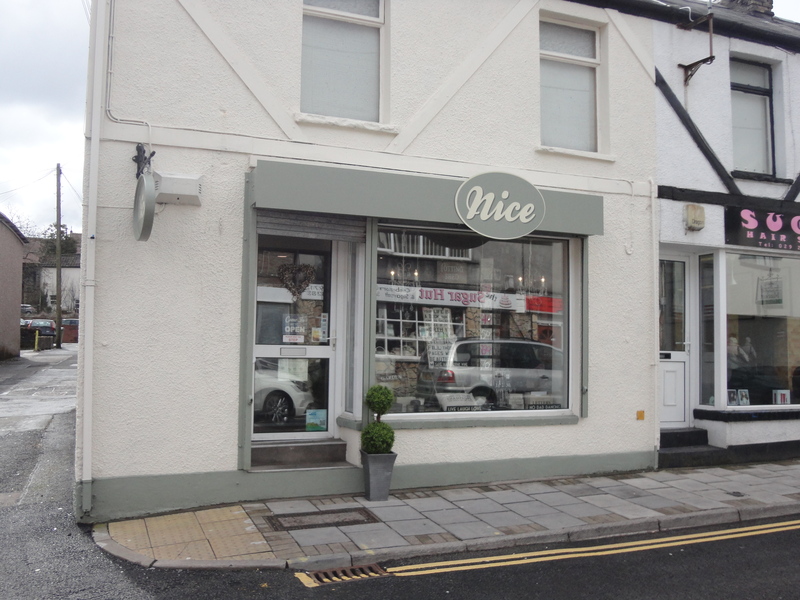 Alfie and I felt it was worth a try – and we were not disappointed! 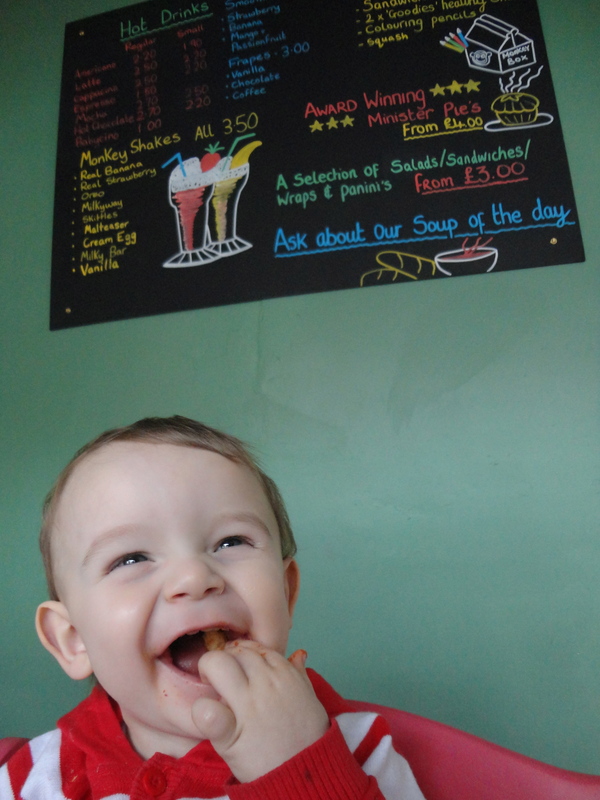 When we first entered the café neither of us were too sure, it was quite full of young mums and their little darlings all milling about. 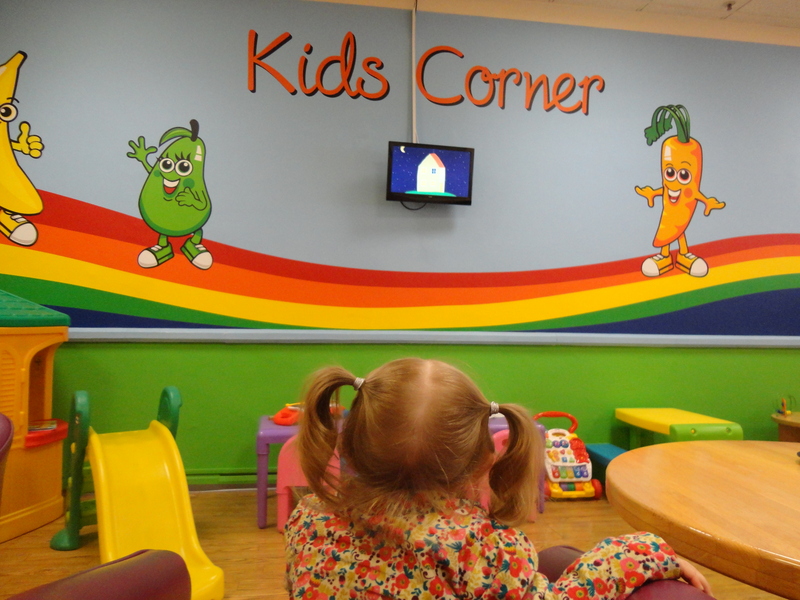 Alfie and I crept in and sat in the corner of the play area and watched! Alfie was soon off playing with all the other kids and the abundance of toys. Bit by bit some left and we had more space and it was great, all staff who work there are trained in childcare and were fantastic with Alfie. The main kids helper a young lady called Lowra, she had a slight Eastern European accent and was superb. She had Alfie and a few other kids dancing and singing and drawing. I soon felt brave enough to go out into main café part and order some food and drinks for us. 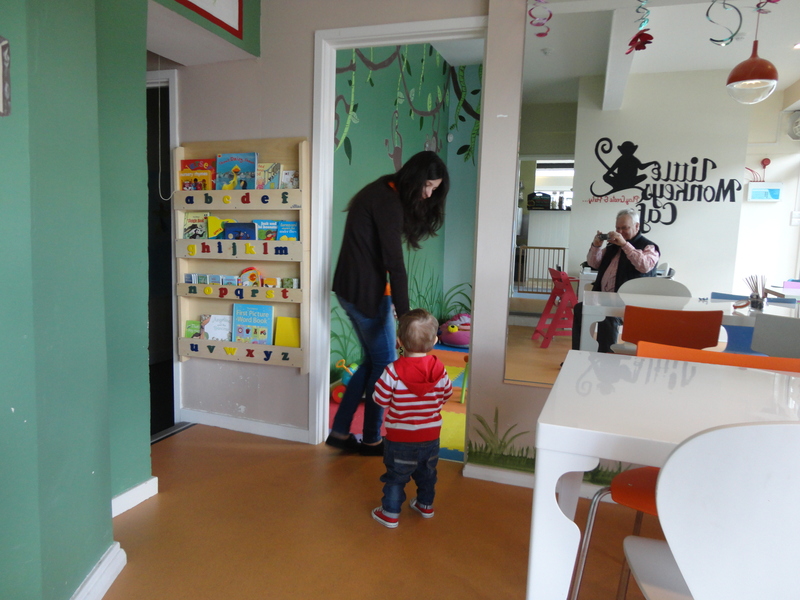 Alfie was perfectly safe, as the playroom is off the café. I ordered a Little Monkey’s fun box of food for the little man and some Brie and bacon sandwiches for me with pot of tea. All the food is healthy and Alfie had a cheese roll with a box of raisins and some organic puffy things and a sugar free drink. We ate together… friends, enjoying a special time together. After lunch Alfie played and an old friend of mine came in with her little son. I haven’t seen Kathryn for some time and I have never seen her son Andrew. He was a lovely little lad, really handsome and so well behaved. Kathryn was with a friend so it was not easy to talk much but she was pleased to see Alfie and he and Andrew played together for quite a while. Soon it was time to leave. I went out to thank the owner for the care and attention shown to Alfie. She invited me back and it’s an invitation I intend to keep. 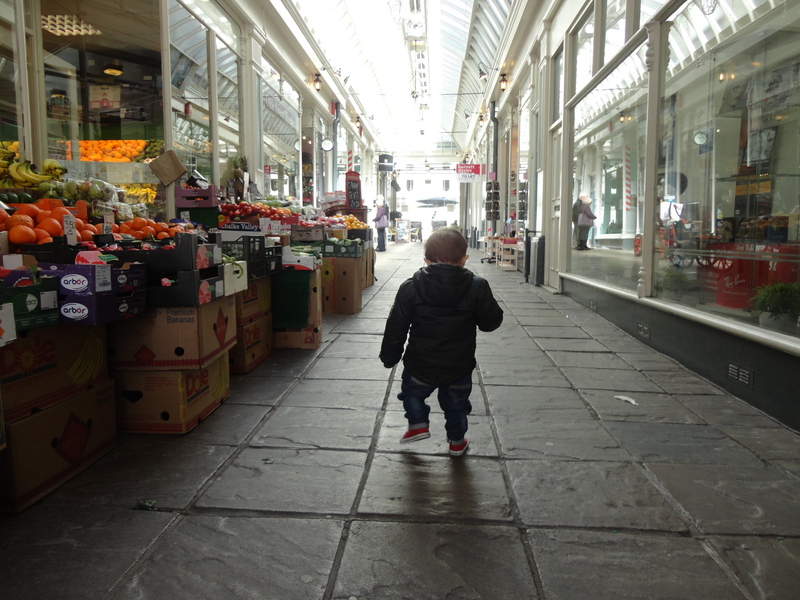 We strolled though Penarth, down the Windsor Arcade and Alfie loved strolling on his own without being harnessed into the puschair. He reminded me of my dad, he looked into and examined every shop he passed, taking an interest in all he saw. How I wish my dad and mum could have seen this dear little fellow, but sadly they left us before that could happen. It was my mum’s birthday today and all day I was telling Alfie what a great lady she was and how she knew – without any doubt – that God would send him along one day to join our family. We had to wait quite a while for him, but God knew best. When we got back to the car we went to visit Alfie’s Nana Muz, another great old lady. Her mind has been taken cruelly from her but she still smiled when she saw him and waved goodbye when we left. We love her a lot and the time we spent with her was precious. 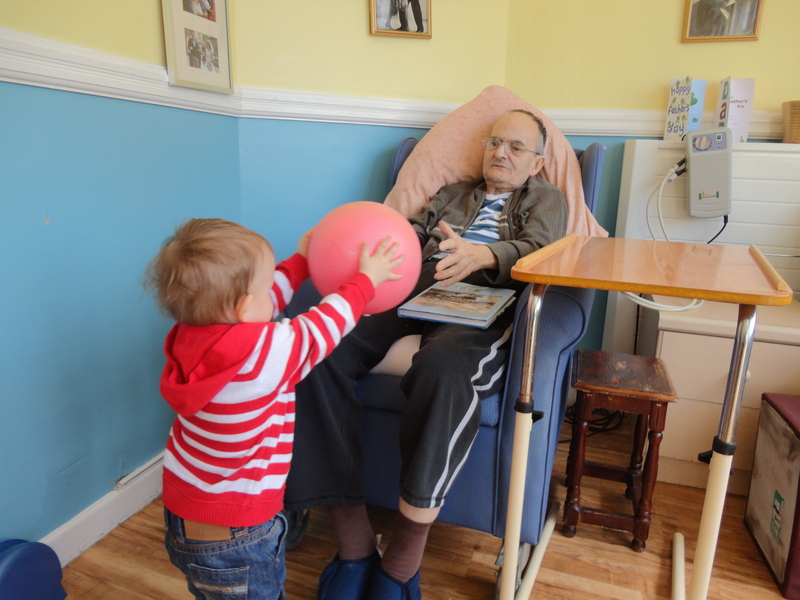 We also chatted and played with Keith – a great old fellow who sits near Beat. 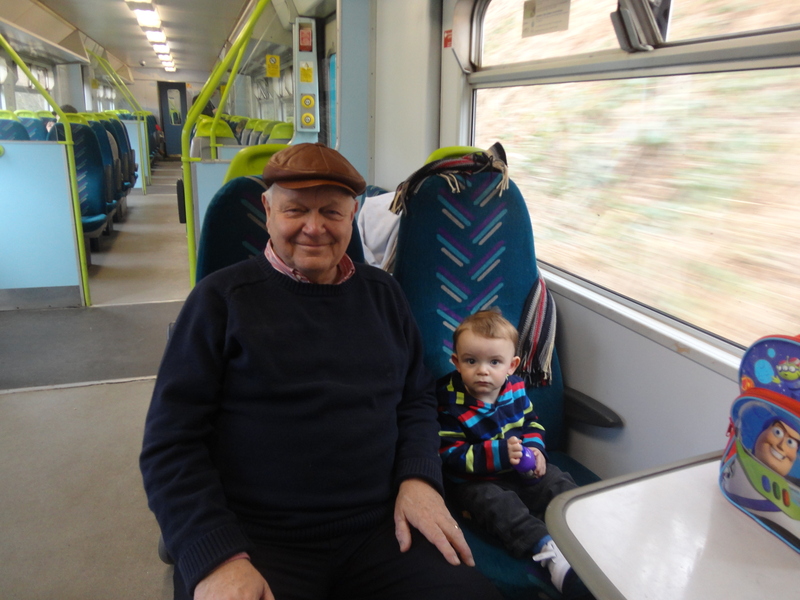 He loves trains, Cardiff City and books about Tiger Bay…my kind of guy! When we got home there was still time to look at the terrapins who have just woken up from their winter sleep. It had been a full and rewarding day. When Alfie’s mum was collecting him she stayed to watch an old video of her wedding to Jason and a part of it has been dubbed with a Martyn Joseph song about Cardiff Bay… it seemed a suitably appropriate way to end a very ordinary but very special day. 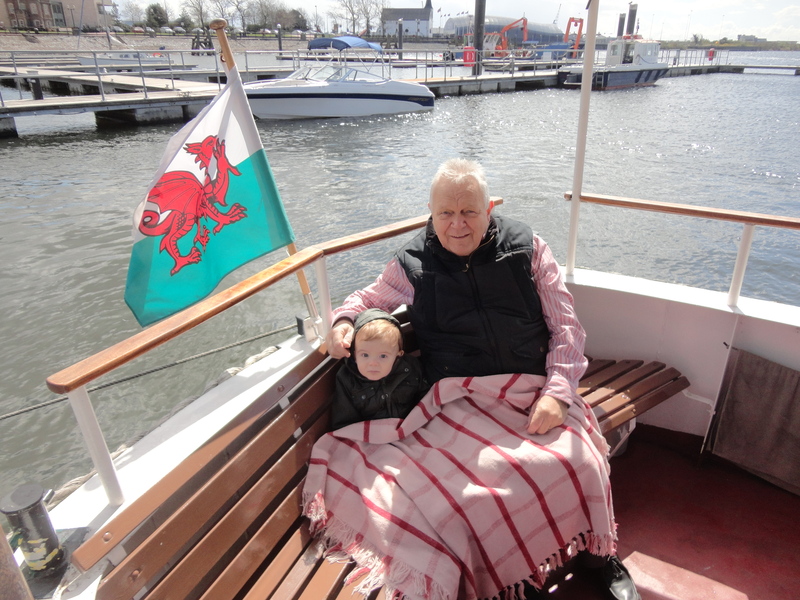 The day an old man and a little boy had spent together… just having fun… exploring Cardiff, boat trips, kids cafes, meeting old friends and visiting great nans! I went out with a young lady today… a very young lady…in fact a little angel. The lady of the house didn’t mind at all! She and I were looking after Princess Mia and Angel Millie while her mum went to work as a supply teacher. Mia has to be in school, so Millie and I decided on a trip to the museum… just the two of us…friends together. It was going to be great. The day started off so well, when cousin Alfie was bought over while his mum went off to run off a few pounds in the gym. 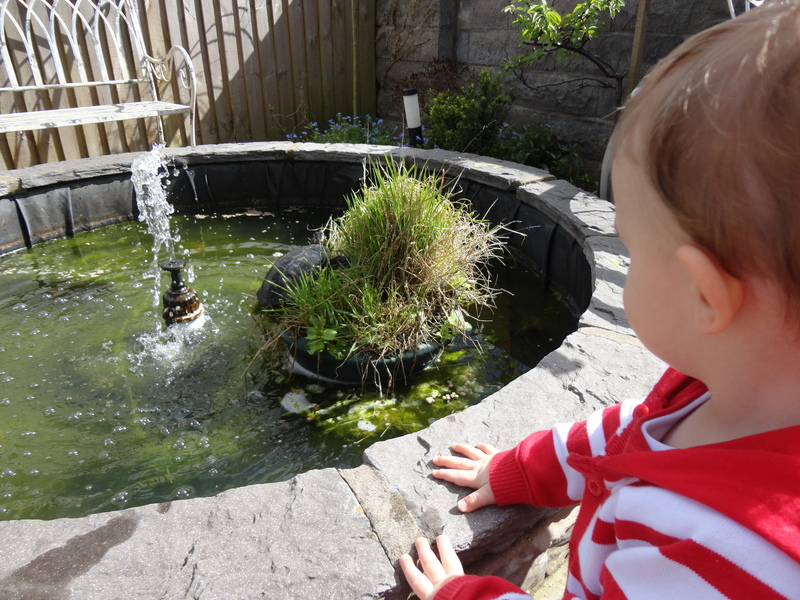 What fun… the three grandchildren, all together at 8.30am on a Monday morning. How is that for a good start to the week!! They played, ate breakfast and watched Disney films, all three side by side on our kids’ settee… the lady of the house was fit to burst with excitement. Alfie was collected just after 10, by his mum, who definitely had been to the gym, looking very hot and certainly a few pounds lighter. 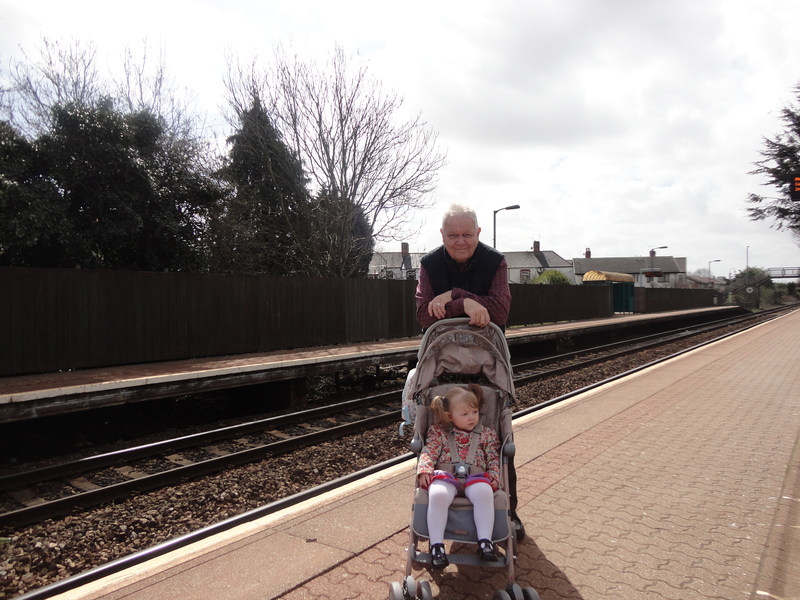 Millie and I set off just after lunch catching the train into Cardiff. 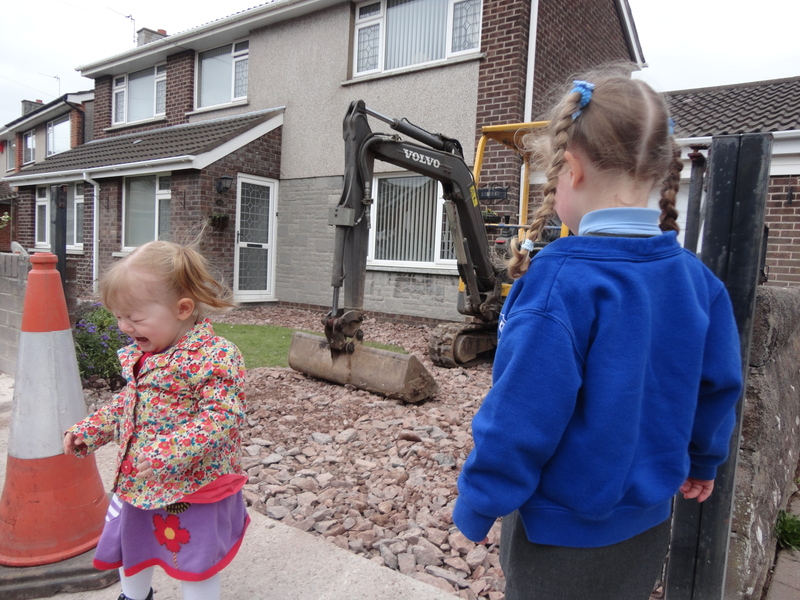 Our neighbours are having a new drive, but Millie wasn’t too interested as I tried to show her. Never mind! There was a delay at the station, which did not bode well for our return some hours later. 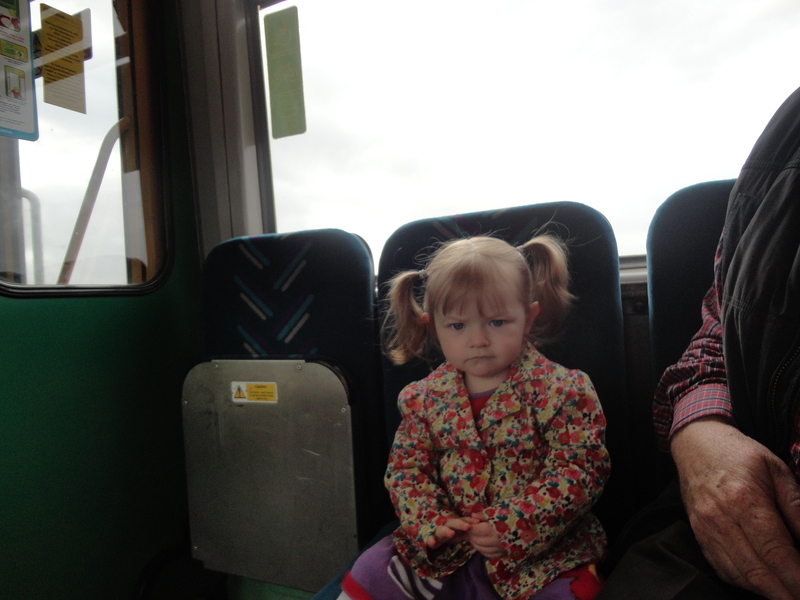 Millie loved the train ride, looking out of the window, shouting and talking all the way. We got off at Queen Street Station and I showed Millie the renovations, which are taking place. 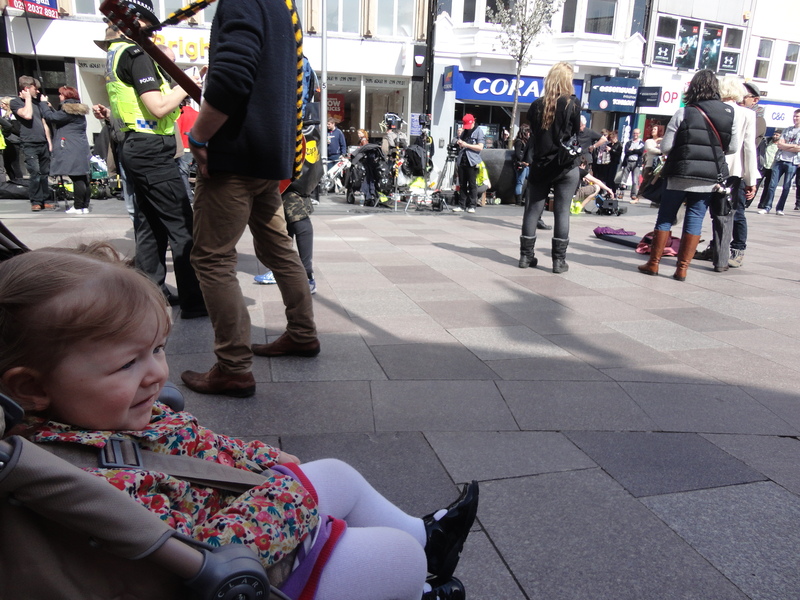 We walked through town and Millie enjoyed the sights and the smells of this great city. 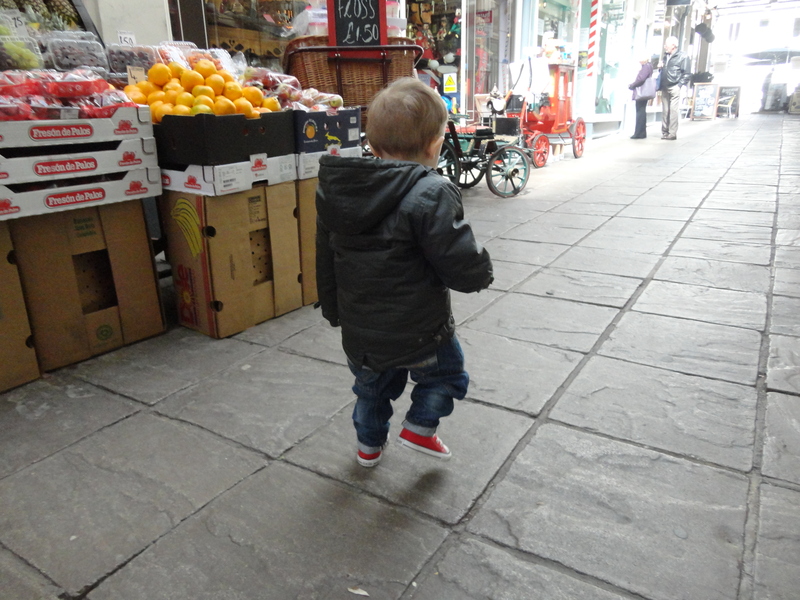 We walked through the Capitol Arcade and noticed several new shops including a new toyshop, which Millie loved. 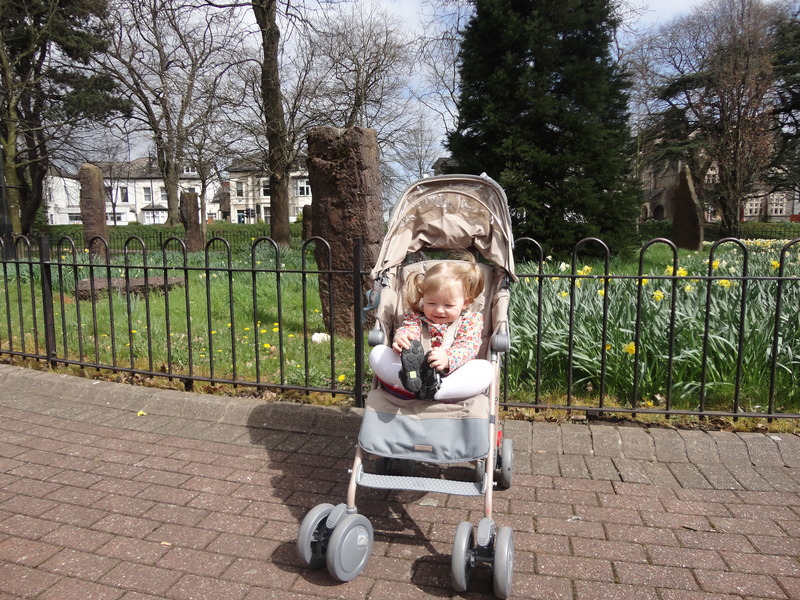 We strolled on, up passed The New Theatre and then across into Gorsedd gardens, just in front of the museum. Gorsedd Gardens were established when the new City Hall was opened in 1905 and Cardiff declared a city It has as its focus the sandstone blocks of a druidic circle. The central altar stones, often used as a site for drunken prancing right up until the eighties, are now gone. The rocks of the Heritage Coast are still standing. They are not just an antiquarian artifact; the stones are nineteenth century quarryings from the cliffs of Penarth. They were used for real in 1899 when the Eisteddfod visited Cardiff and held its performances in a massive wooden shed erected where City Hall now stands. That was the Eisteddfod where the committee threw tradition to the wind and opened a bar on the Maes (Eisteddfod field); no poem was found to be good enough to win the chair; and on the last day the pavilion collapsed. The omens had all been bad. The stones were moved when the City Hall foundations went in and it was agreed that they should become the centrepiece for a new public garden. There’s no celebratory plaque and their origins have been forgotten. In the sixties Tom Jones, Wales’s macho rock and roll dynamo from Pontypridd, played the Cardiff Capitol and underestimating his attraction to the massed screamers ended being chased up Park Place and into the Gorsedd Gardens where he hid himself behind a weeping cherry. Happy days! It’s the Cardiff park that gets the most foot traffic. 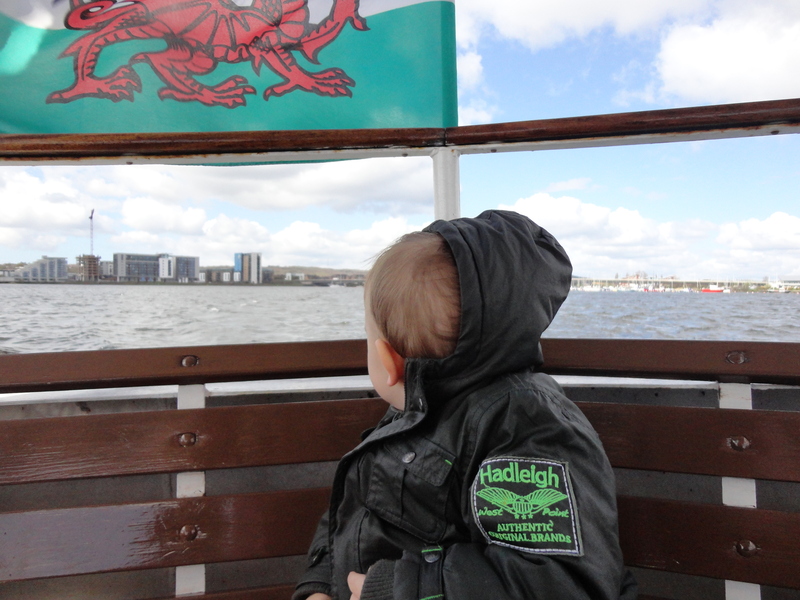 You might think it would be Roath Lake, crammed with citizens any sunny afternoon or Bute Park, the vast swath of grass and trees that runs from the Castle to the Cathedral. Gorsedd gardens have three entrances, two paths and some of the best-maintained flowerbeds in the city. 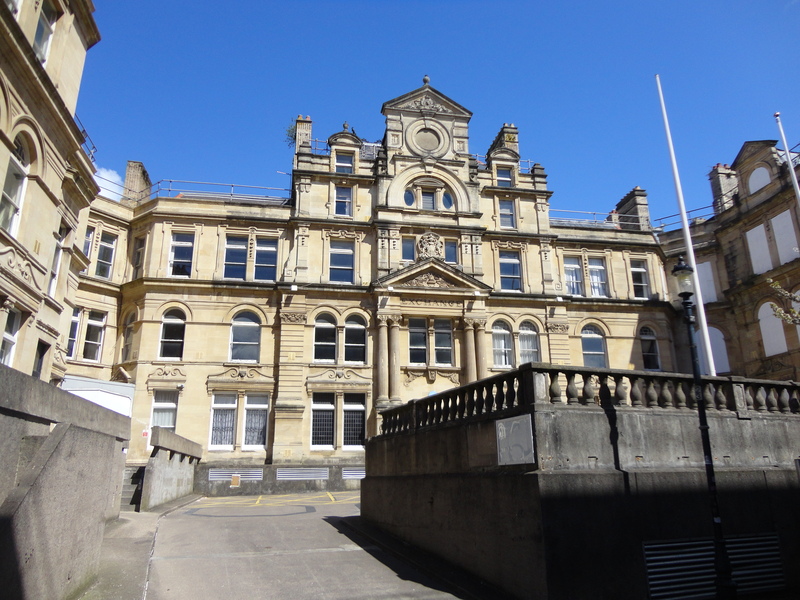 These are seen daily by the thousands of workers who track from Queen Street, the station and the car parks, to the National Assembly Government, the City Hall, the Temple of Peace, the University, the Law Courts and the many other official centres of Wales. In the gardens are statues of Lloyd George, high on his plinth, dripping green as his copper degenerates and John Cory – Coal owner and Philanthropist – silently facing the bushes and the bustle of traffic rolling, along Boulevard de Nantes. We stopped to record the visit on camera and I chuckled as Millie let out a loud… ‘CHEESE!’ as she did every time I held the camera up. Some people were laughing as they sat enjoying the afternoon sun. When we got to the museum, we were disappointed. 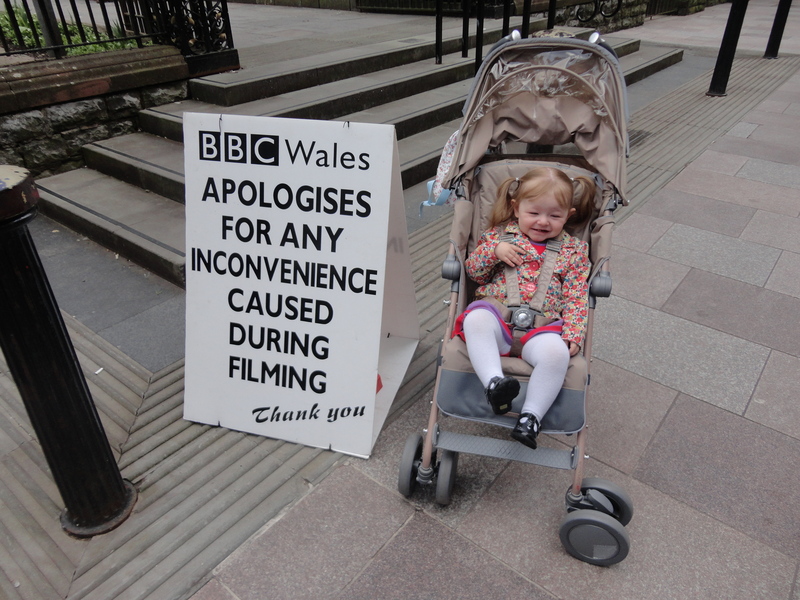 There were some film crew lorries outside and as I prepared to climb the steps with Millie, a loud cry came to us and we were turned away, and we were told the museum did not open on a Monday. 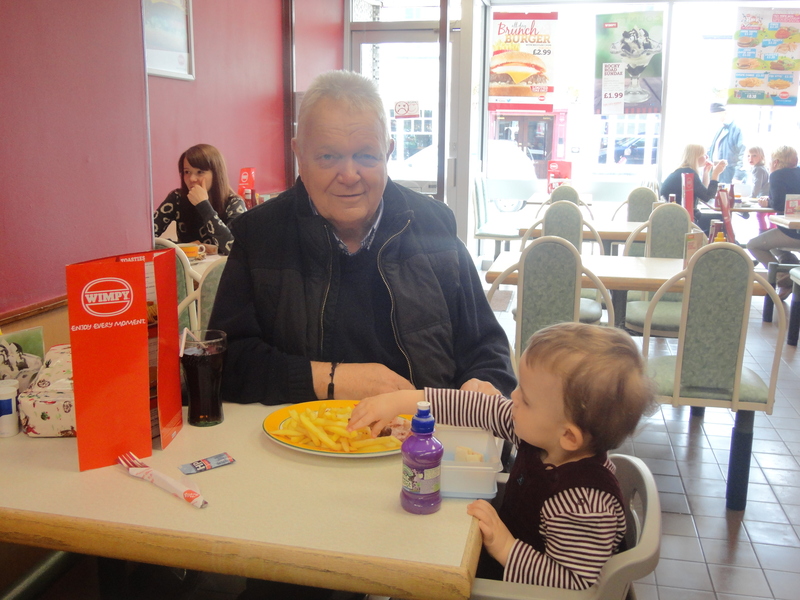 We had no other option than to head for town and what else could I do when I take a young lady out other than take her for afternoon tea in Howells. We stated to make our way there. 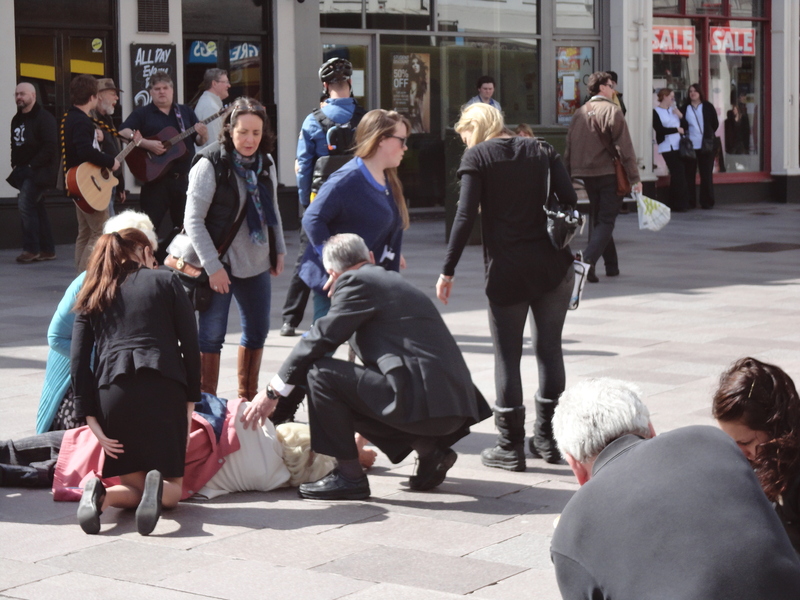 As we turned to corner into Working Street there seemed to be a major incident taking place with an ambulance and a police car and crowd of people. A lady lay on the ground, looking the worse for wear. 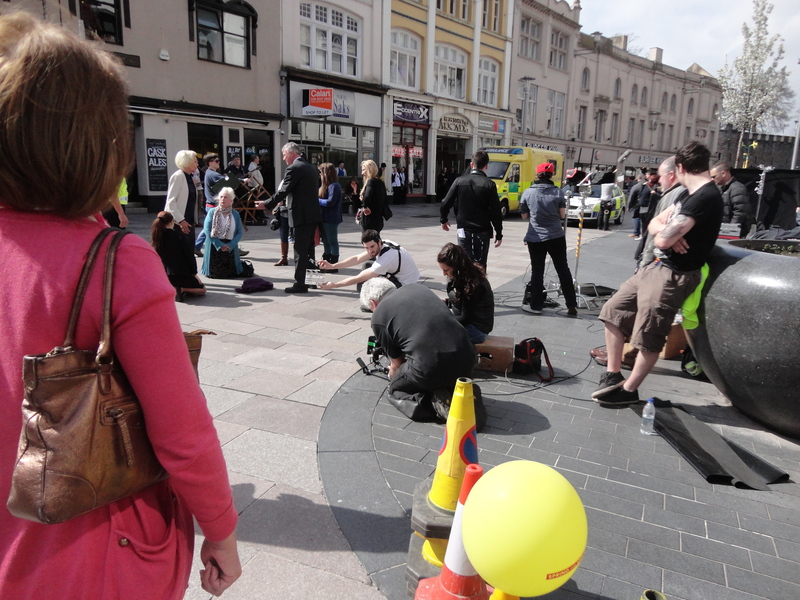 A group of buskers were miming and several people were speaking to police officers. 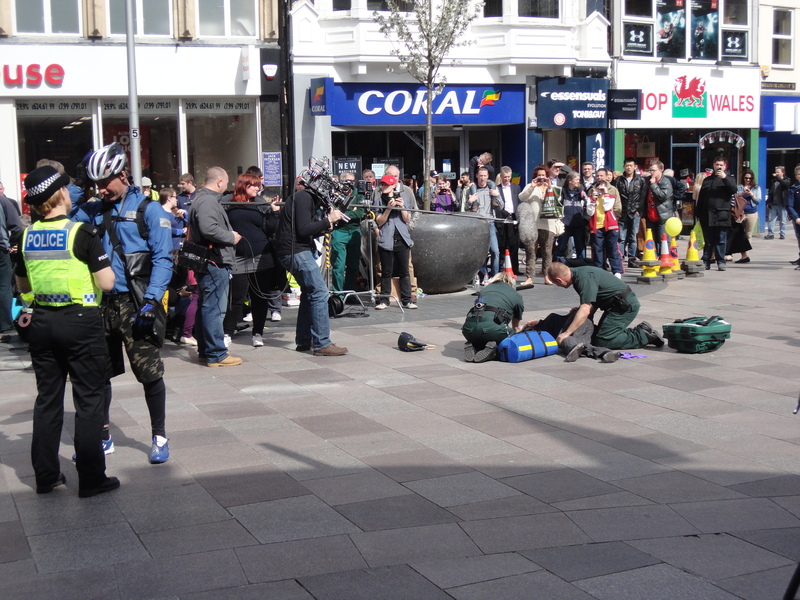 As it turned out the BBC were filming a scene for the series Casualty. We both watch fascinated. The director clapped his clapper board and shouted ‘Scene 120 take 2 ‘ and as the scene began there was a sense of quiet among the crowd, till a little voice shouted ‘CHEESE’ as the camera came into view. It was a beautiful moment, which I am sure will be edited out. There were several broad smiles from those around us. We were determined to be extras come what may and I watched carefully for our chance. In another scene, as it started, Millie and I broke ranks and walked right across the ‘set’, although slightly in the background. They did not do a retake so I think we made it! 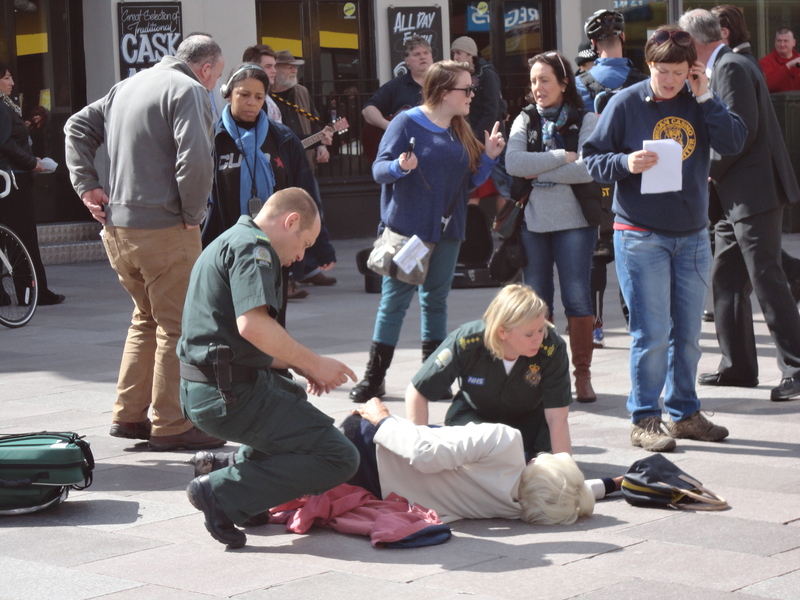 If you watch Casualty, it’s the episode where and elderly lady with blonde hair get’s knocked down and as the paramedics arrive and run to her, Millie and I will be seen walking from left to right near the ambulance! 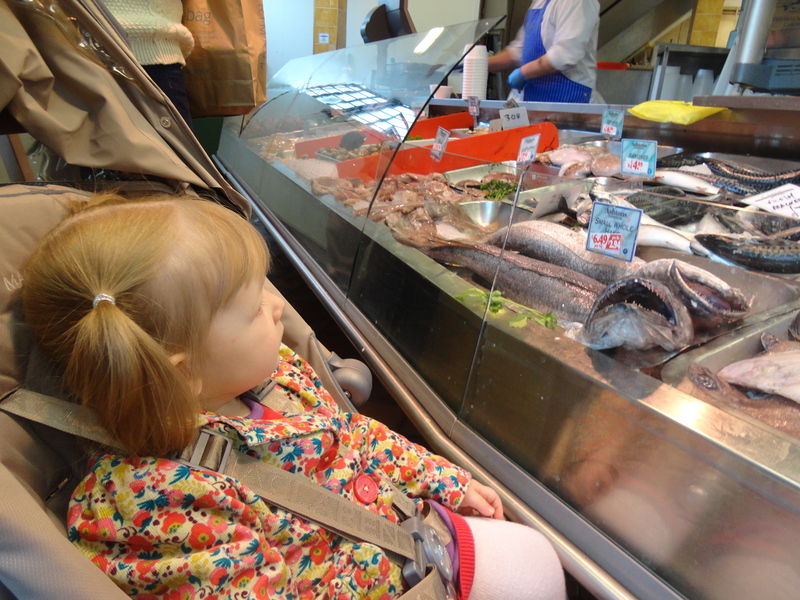 We pushed on to Howells and detoured into the market. Millie refused to be initiated into the Cockle Lovers Club but loved looking at the fish. I also showed her the saltfish and told her of my childhood treats. 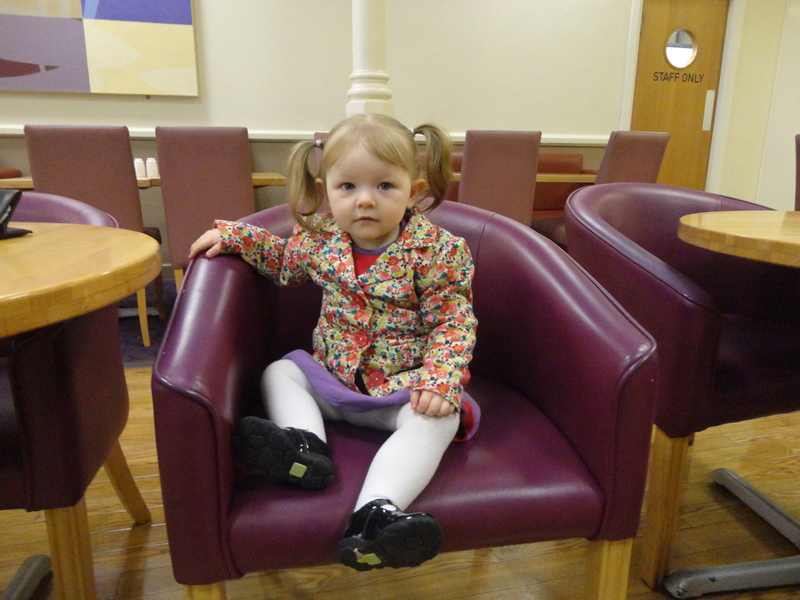 When we got to Howells, we had the kids’ area to ourselves and we enjoyed some quiet, quality time together, over a pot of tea, a pecan and raisin Danish and some oat biscuits. The assistant put Peppa Pig on the television and we both loved this quiet but special little time together. 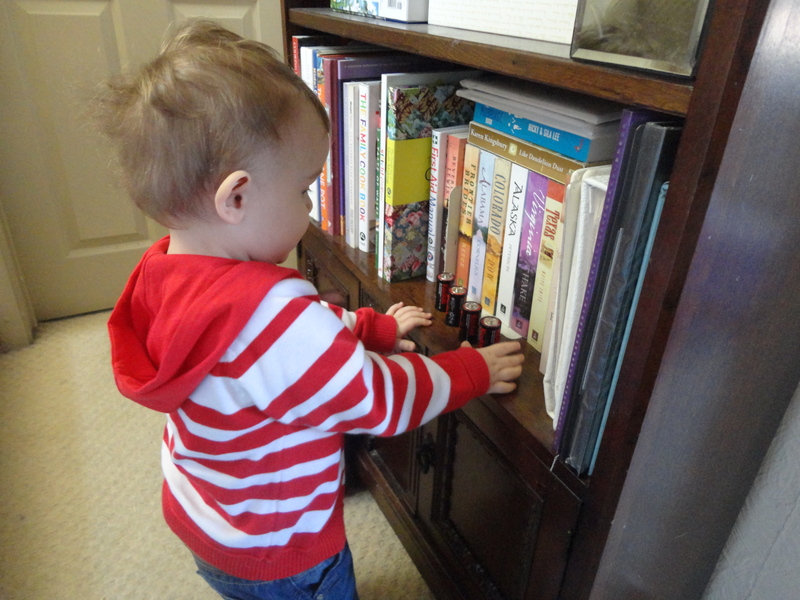 Millie played with the toys and read a few books before we made for home. As I expected we were held up on the Central Station for a long time. 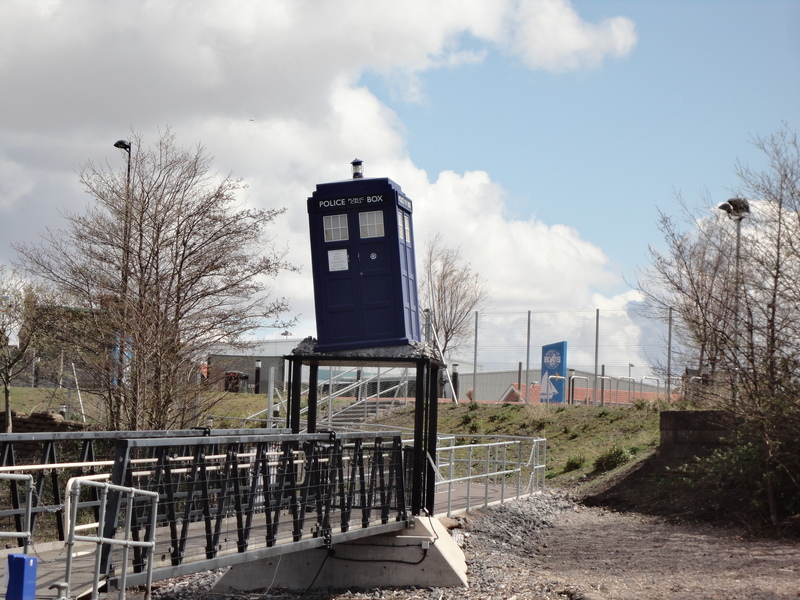 The delays had been caused by a points failure in Grangetown, just the way we were headed. It did give us chance to look at the trains and I am sure Millie loved them as much as me. She was pointing and talking as they all came and left. On the train ride home a young lady was fascinated by Millie and complemented her over and over for her cute looks and smiles. I was proud… very proud. Little did I know at the start of the day what a lovely adventure awaited us. Alfie stayed overnight and the dear lady of the house slept in late so it was up to me to dress, feed and prepare the little man for the day ahead. We had a lovely time just doing things slowly and enjoying each other’s company. Alfie was playing so well, that I even thought at one time about staying home and just enjoying his company, but thought better of it and at just after 11.00am we were ready to go adventuring. 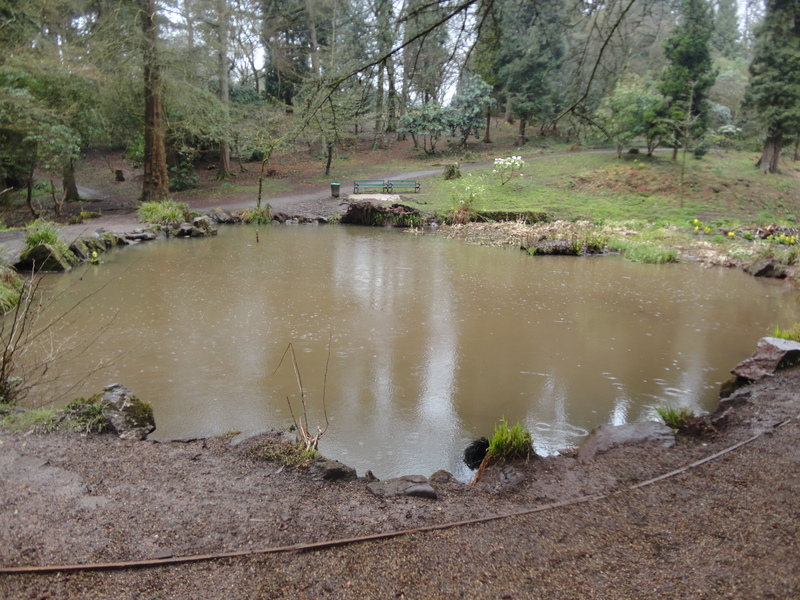 We had thought to visit Caerphilly and Cefn Onn Park. I think I have only visited the park once in the last quarter of a century, but it’s a place I remember with such fond affection from my childhood. 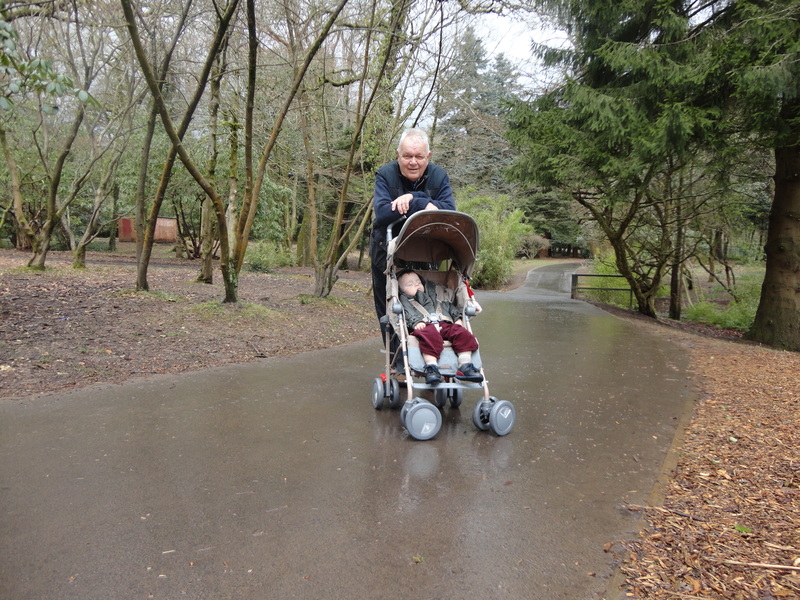 We lived a couple of miles from the park in Llanishen and would regularly visit the park, which meant a long walk there and back up Heol Hir and across the fields. Now, sadly, the sprawling Thornhill Estate comes right to the park gate. We caught the train from Eastbrook, but needed to change in Cardiff as our trains run only to Merthyr or Aberdare. It meant I had to ask Alfie to stay in his puschair. We changed at Queen Street and I noticed the renovations are going ahead well. 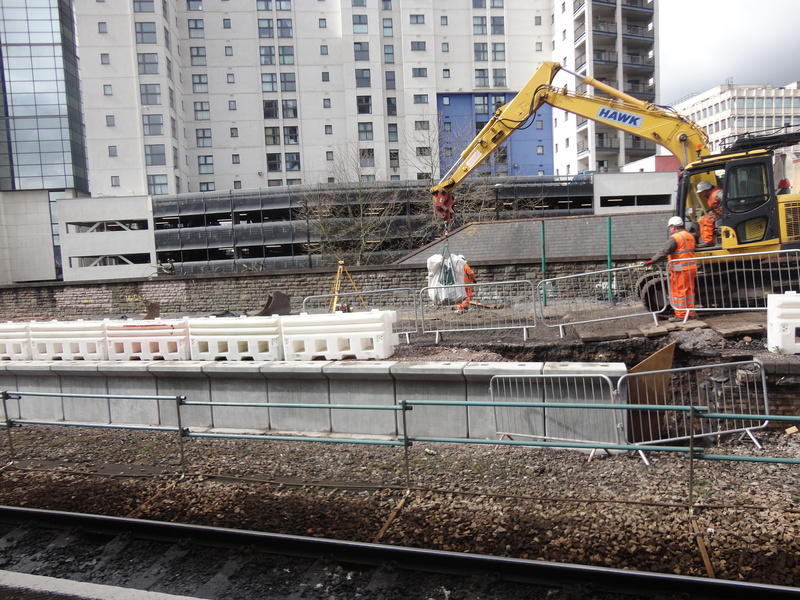 I am not sure what they are doing but it certainly includes a new platform, where the disused Platform 1 used to be. Alfie loved looking at the diggers working away. 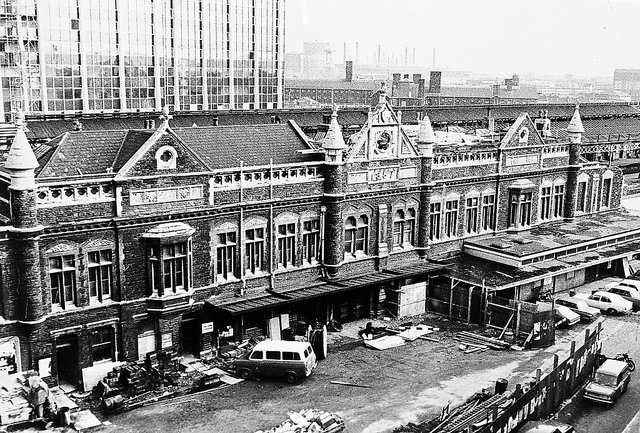 I regularly used Queen Street station in the fifties and sixties and it was a grand station in those days. As we left Queen Street we passed Heath High Level and Llanishen Stations, both very familiar to me, as I used to live halfway between both stations and caught the train from both many, many times when I was young. Sadly that will probably remain what it is – just an incredible dream. I don’t think such a dream could ever come true, but I will hold on to it, dreams are the magic of life. Before Llanishen Station I caught a glimpse of my parents’ old home. We also passed The Court Field, where for many years I enjoyed the Whitsun treat with my old church. It sounds really quaint now, giving the kids a treat of a day out on a field for being good in Sunday school. Happy Days! The guard had warned me that if I wanted to split my journey and get out at Thornhill it was best to do it on the way back, to keep the inspectors happy! So we sat on the train all the way to Caerphilly, it meant travelling through Caerphilly tunnel. Caerphilly Tunnel at just over a mile in length, is the longer of the two tunnels on the Valley network, the other is at Cogan. 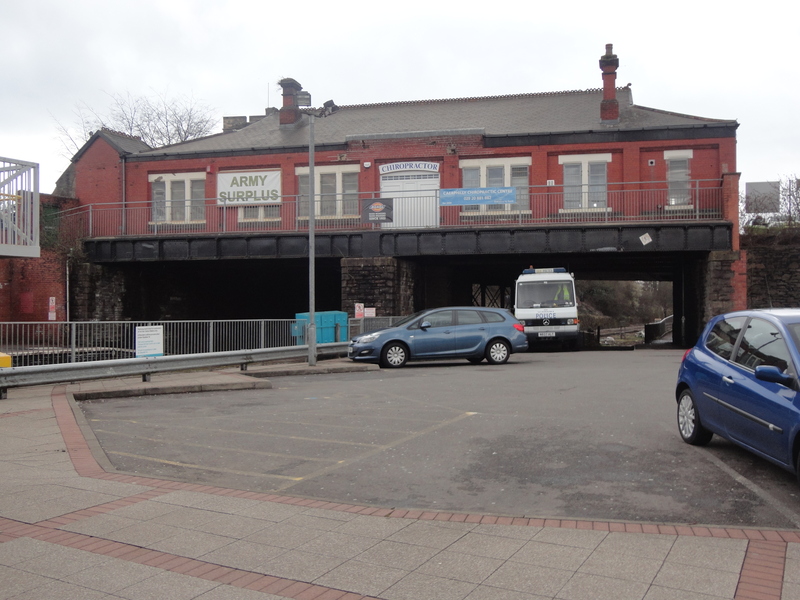 It was built by The Rhymney Railway Company. 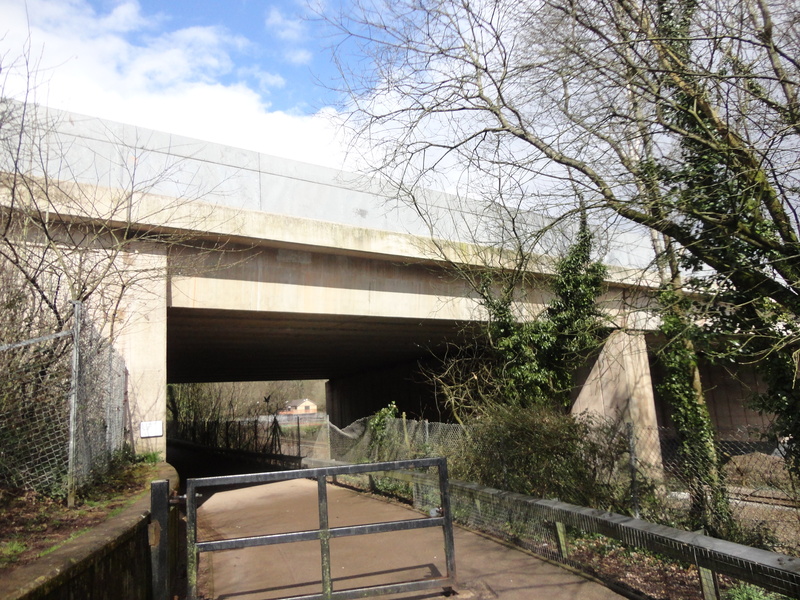 Seeking to build an alternative route to Cardiff Docks to rival that of the mighty Taff Vale Railway, the company was granted parliamentary permission to create a new line running from Caerphilly, through Llanishen to Cardiff. In order to do this, the company first had to blast its way through Caerphilly Mountain, creating a tunnel some one and a half miles in length. Unsurprisingly, in an age before health and safety of any kind, accidents were common, and a large incident inside the tunnel cost the lives of several of the railway “navvies”, some of whom were buried in St Isan’s churchyard in Llanishen. 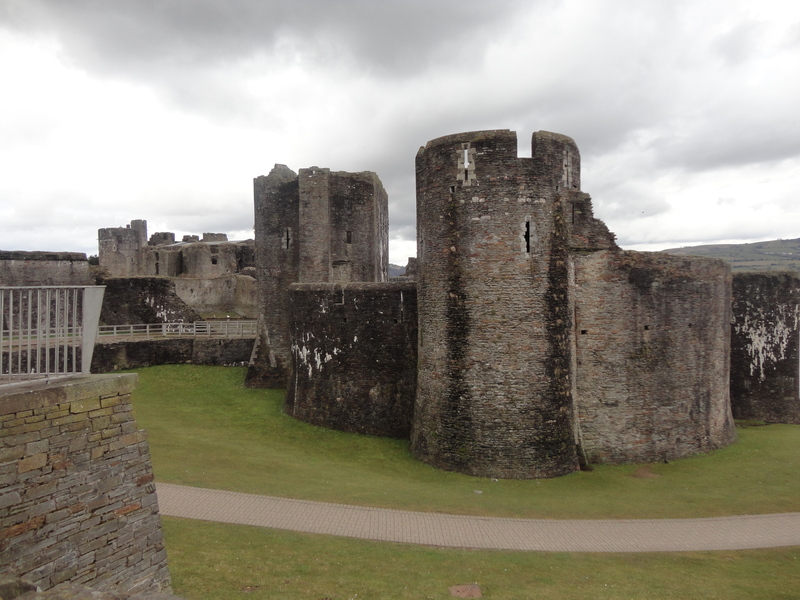 Alfie and I had visited Caerphilly before but coming by train took us to the ‘top end’ of town. 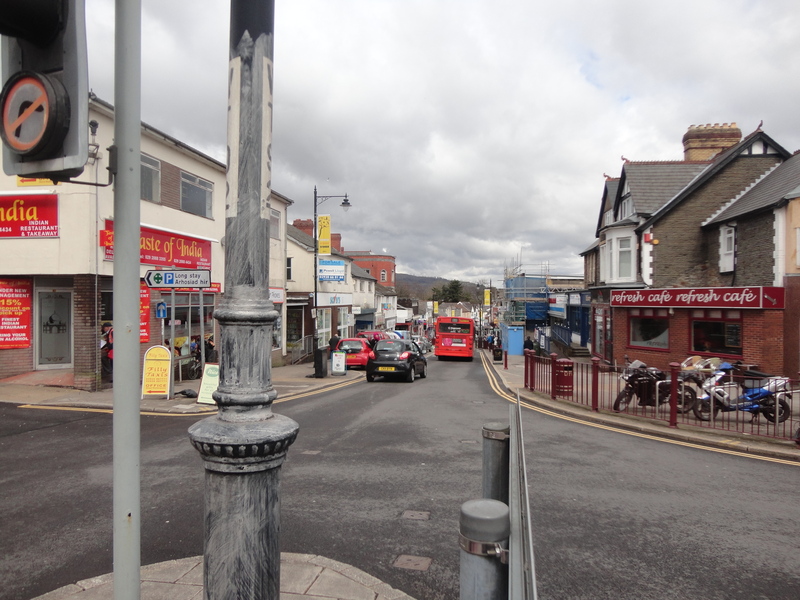 When we arrived in Caerphilly, we got off the train and we knew straight away that we were at the top end of town because we passed a garage called The Top of the Town Garage. All was well. 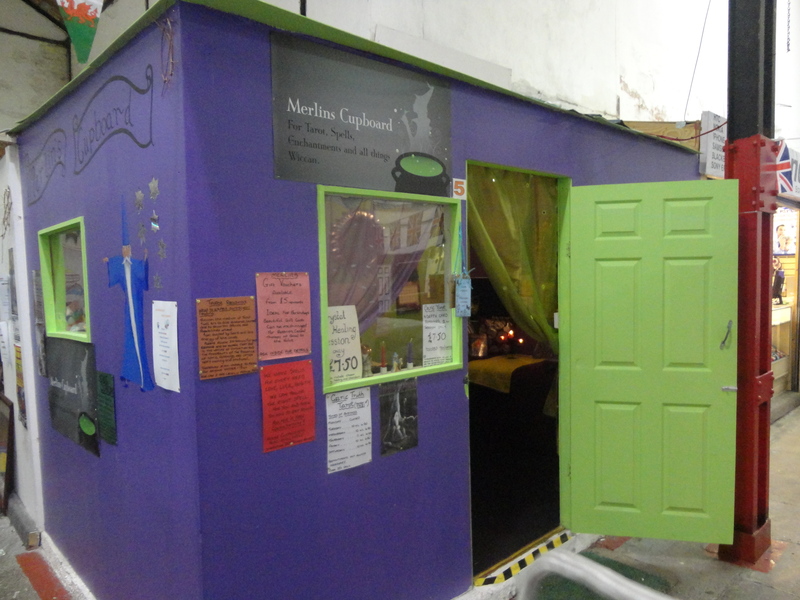 We were hoping to unearth some treasures and we soon passed a shop that the lady of the house would absolutely love. It was a kind of vintage shop, many of which are springing up all over the place these days. I loved a plaque in the window and hoped it was true of my three beautiful grandkids and the lady of the house and me. It made me think again about the beautiful home she has made for her family. I am blessed to have such an incredible person as my wife and soul mate. I hope she knows how much she is loved. 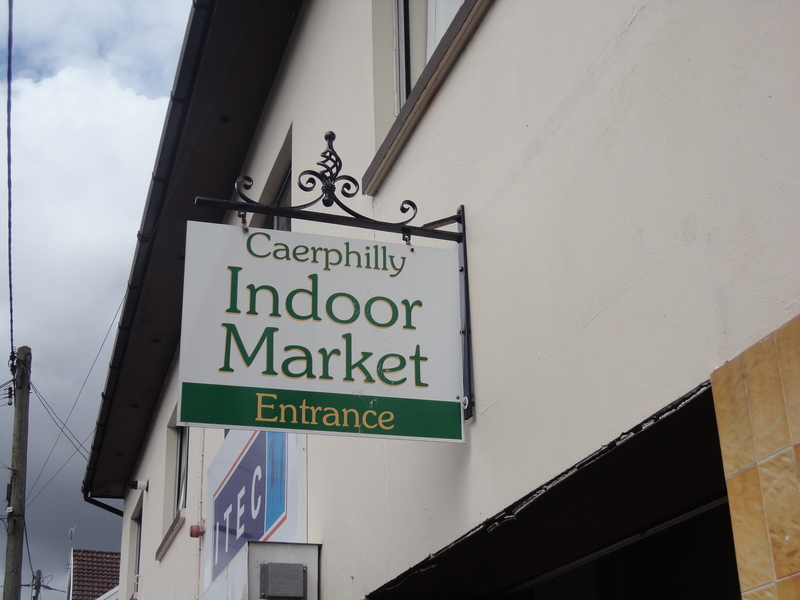 I was deep in these thoughts when a sign caught my eye… Caerphilly Indoor Market. Great… time to check out the faggots! It always seems strange to me that in a market you can always buy faggots. My old dad loved them and would often buy one if he was out and they never once reached home! He would nibble away at them until they were gone! 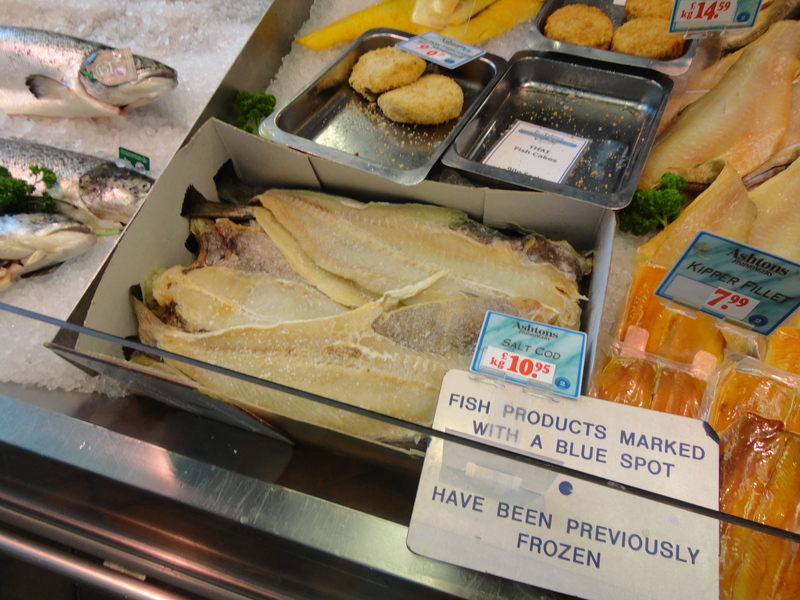 Caerphilly market was a huge disappointment, probably the worst market I had ever seen. I felt sorry for the few stallholders who were there, striving hard to make a living. I wish them well. I don’t know what the future holds for them; perhaps I should have popped into Merlin’s Cupboard to find out! 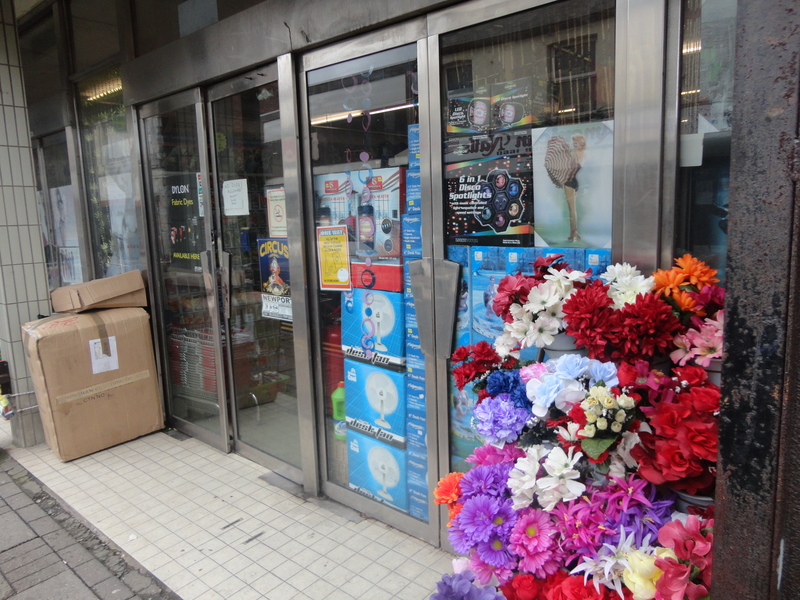 As we came out of the market we passed a tacky Bargain Store, and I noticed that the shop was probably a Woolworth’s in a former life – the doors were a giveaway! We went on down through the High Street and as I was crossing the road by Specsavers I saw something that made me rub my eyes in disbelief! 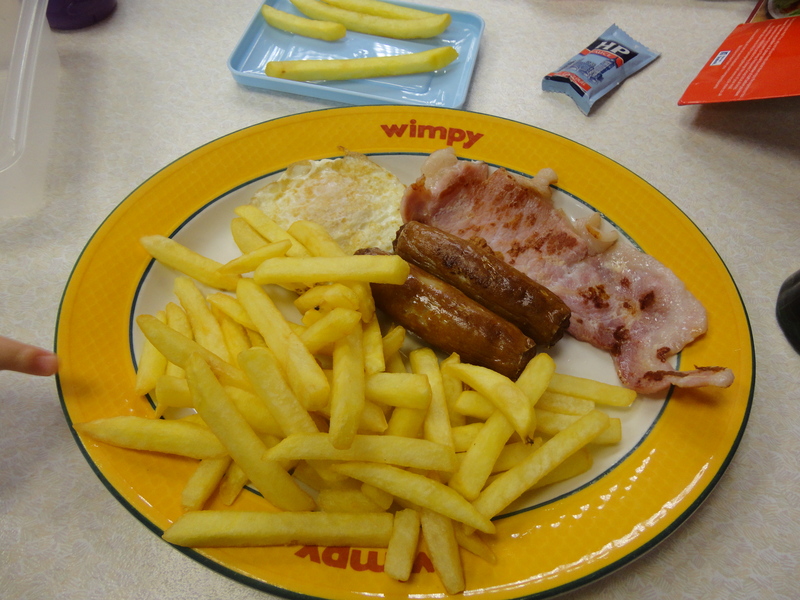 A visit to a Wimpy is normally the highlight of my visits to Lesotho and South Africa, I didn’t know any Wimpy existed in the UK any more and here was one in the quaint little valley town of Caerphilly. 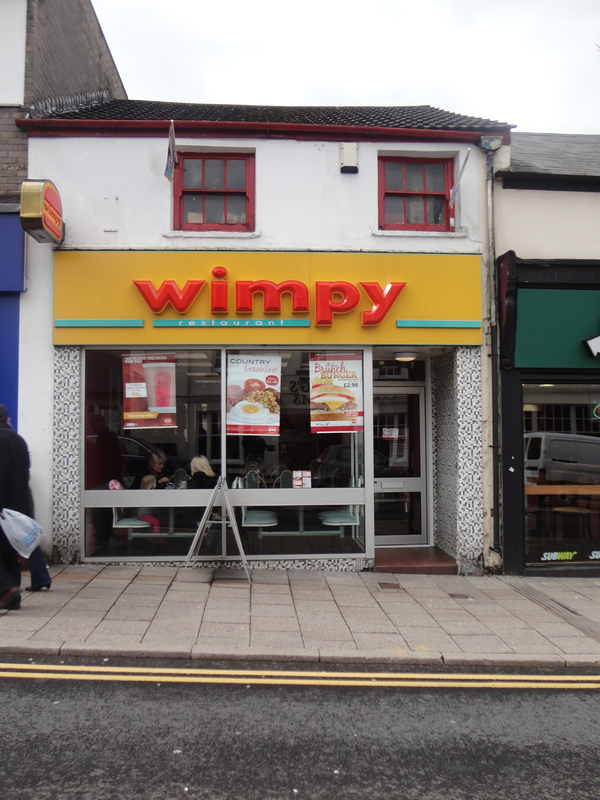 Wimpy was the original ‘McDonalds’ for my friends and me as were were growing up. It was our initiation into the world of burgers. We HAD to go in. The welcome we had was outstanding! This lovely lady rushed over to help me through the door with the pushchair, fussed over getting me a high chair and even told me it was better if I took the tray off it as it fitted better under the table without it. Alfie and I settled in quickly. Coats were discarded and we set about eating. I had made Alfie’s lunch before we came and when I asked if it was alright to eat it in the café, I was told in no uncertain terms that it was fine. The menu was brought and lunch ordered. I was in heaven. 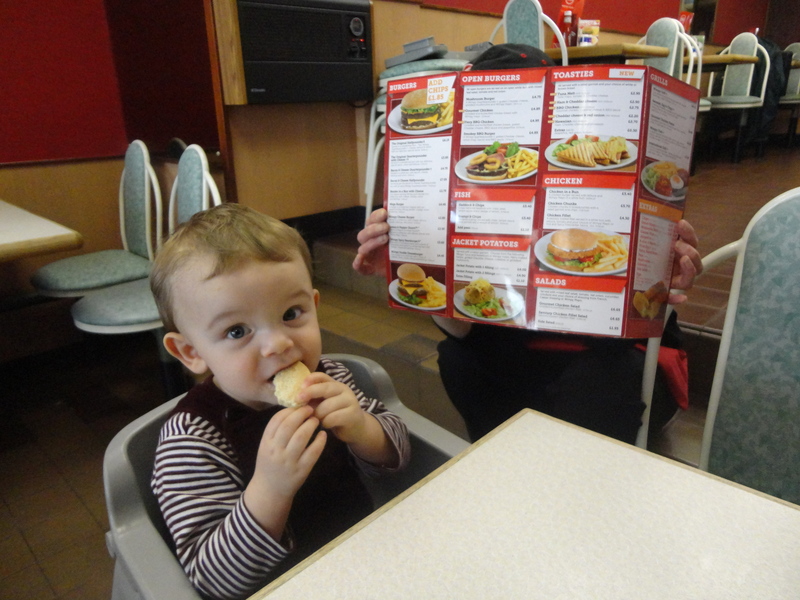 A Wimpy in Caerphilly! The older lady and a younger one chatted and fussed and made me feel like I was royalty. They promised to read this account of our day and if they do…ladies you were wonderful, my only regret was you opted out of the photographs. I was invited back any time and was instructed to bring the lady of the house and the rest of the family. I am tempted to, but I am not sure if the Wimpy Menu manages to align itself too well with the Slimming World Fat Girls Club guidelines for health living. Alfie ate all his food and even he managed to steal a few of my chips, as I was distracted having my photograph taken. Happy days indeed! Unusually I had a meal and a dessert – the Rocky Road Sundae was on special offer! We left totally happy and browsed around the top end of town and even managed to explore the lower end of town around Morrison’s. 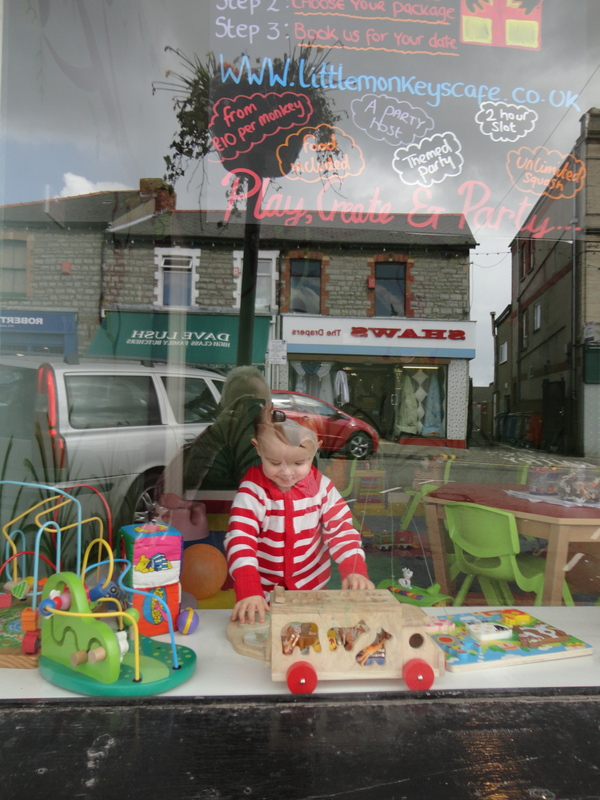 We went in every charity shop and I can tell you that the good folk of Caerphilly do not send many quality goods to the charity shops. I had no pickings at all today. Never mind, there will be other days, other charity shops and other bargains. 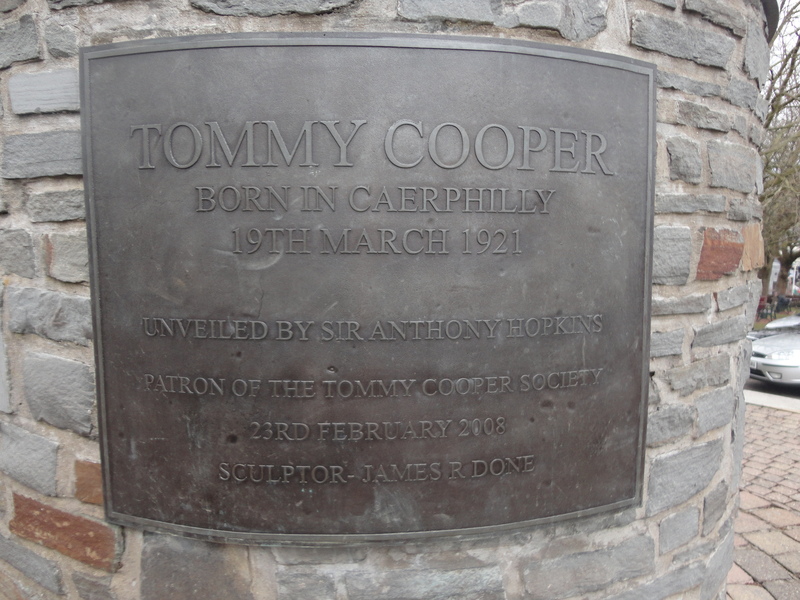 Going to the lower end of town meant passing the castle and the statue of Tommy Cooper, the comedy legend who was born here. I walked past Glanmor’s, new shop and then further down to the old one. 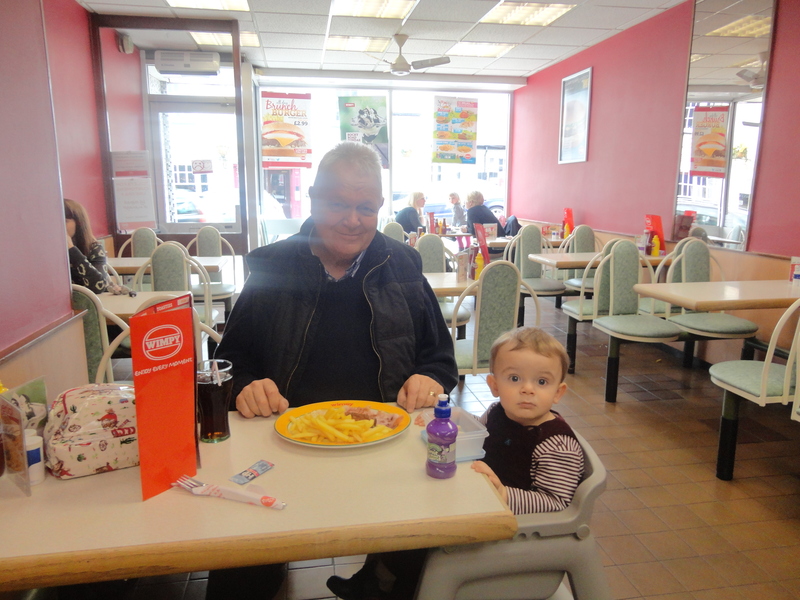 Alfie had fallen asleep, so I didn’t matter that Glanmores don’t provide high chairs. I looked in at the white table cloths and the waitresses, I could have sneaked for a cup of tea and a custard slice or some of the advertised lamb cawl, but I thought of the Wimpy, patted my belly affectionately, and walked past. 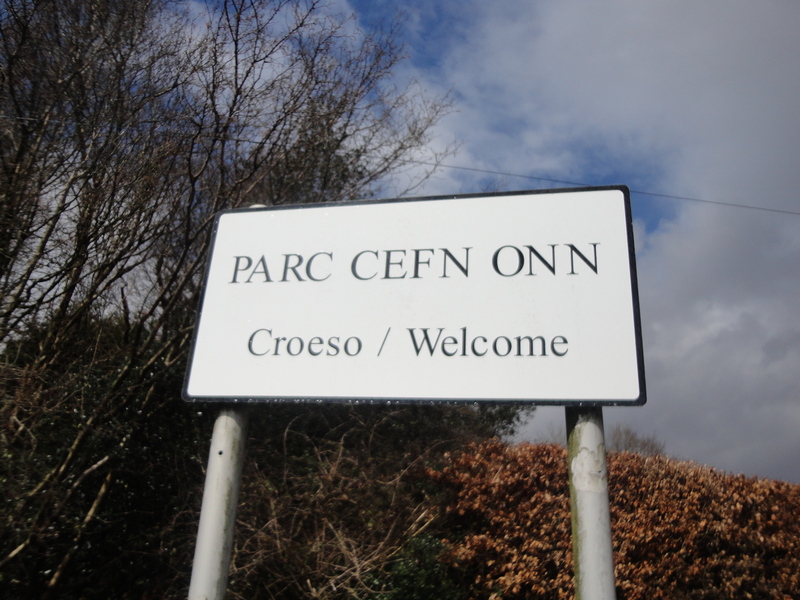 We strolled back to the station, past innumerable betting shops and amusements shops and waited for the train to take us to the next stage of our adventure, Cefn Onn Park. I looked at the darkening skies, it seemed like rain was on the way. As I approached Caerphilly Station I noticed that years ago it would have been a much grander affair. One of the old bridges had now been incorporated into the car park and the old track bed filled in. Sometimes I wish I could turn back time and see how things were, but I would always have to turn it back again to allow me again to enjoy these incredible days with my grandchildren. 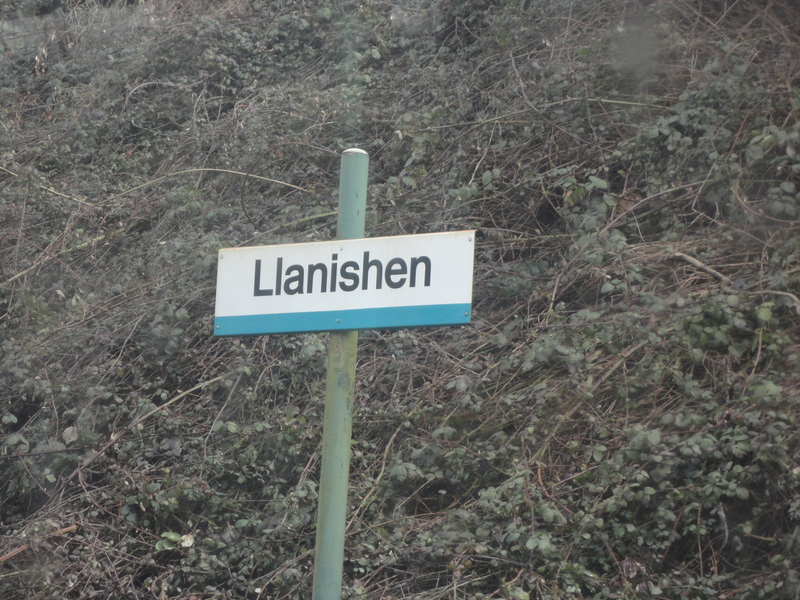 I almost stayed on the train, but as we arrived at Lisvane and Thornhill we took the plunge and jumped off. I was expecting a long walk, but soon realised the station was almost at the park entrance. Parc Cefn Onn a country park on the northern fringes of Cardiff. It contains a truly magnificent collection of native and exotic trees set within an intimate valley. Visitors enjoy the stunning scenery and the calm, relaxing atmosphere. The park was originally designed some 90 years ago taking advantage of the gentle valley containing the Nant Fawr stream. I think this is the same stream that runs through the woods where I used to play as a boy! 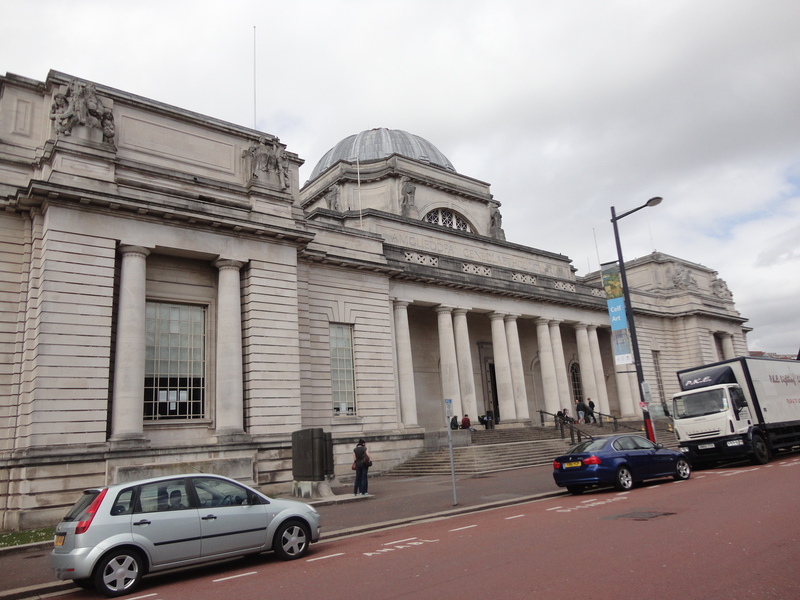 Cardiff Council acquired the site in 1944 and continued to invest in this great asset to the city. 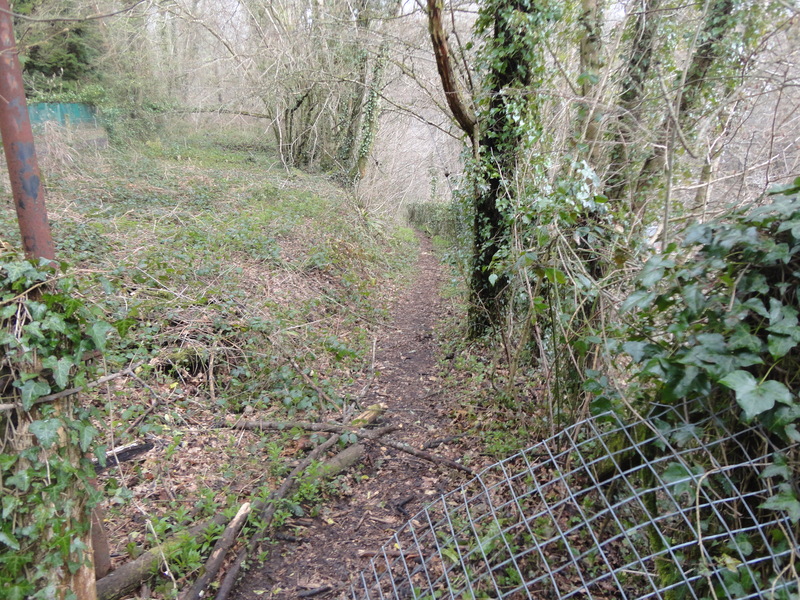 A car park and good path network are now provided. The streams, ponds, woodlands and other planting make this a rich haven for wildlife. Visitors regularly return to enjoy the park in different seasons. Sadly, a thumping great motorway nearby has put paid to the tranquility of the scene around the entrance with the area now resonating to the endless roar of M4 traffic. However it didn’t take long to walk through the park and leave the traffic noise behind. 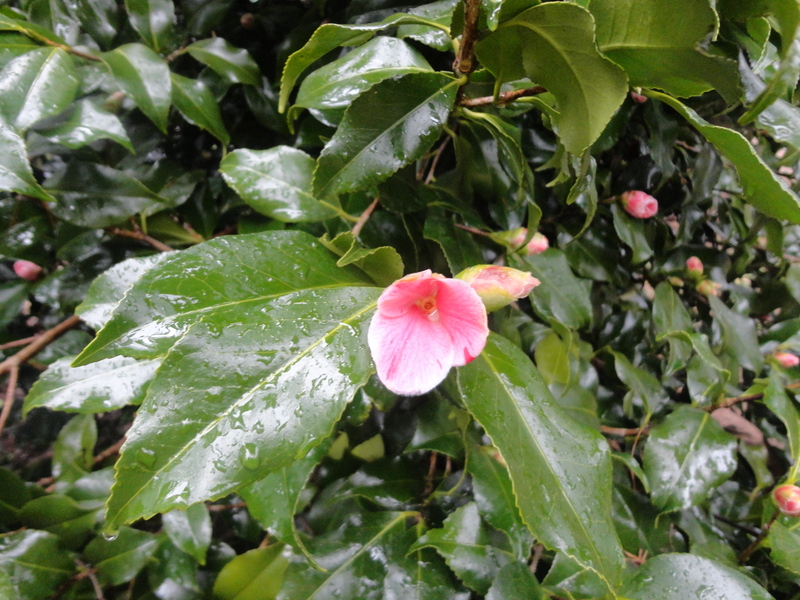 Despite being April the park showed few signs of the outset of Spring. Trees loomed large overhead like skeletons against the darkening skies. 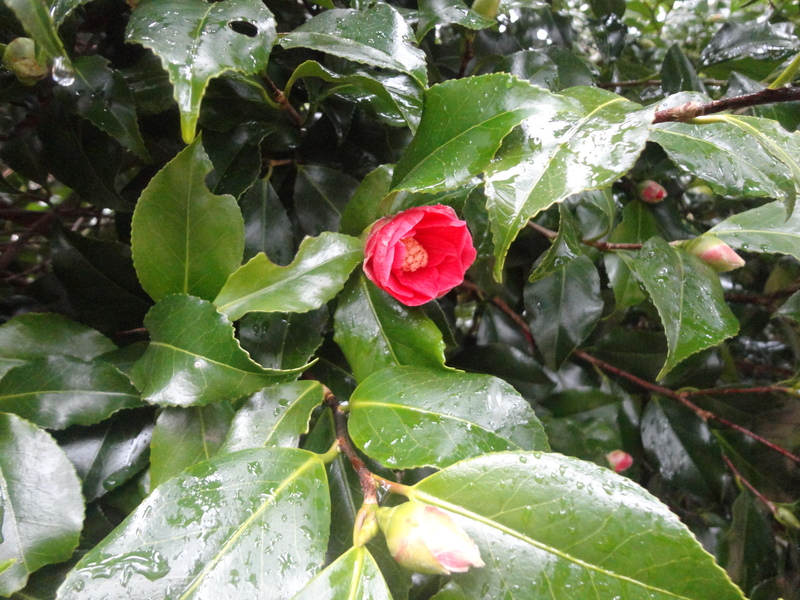 There were though one or two signs that the long winter was ending. Before long the rain started. We made a dash for the cover of some larger evergreen trees and avoided the worst of it. True adventurers don’t let a bit of rain deter them. Alfie woke up, as usual, with a big grin on his face – he’s such an incredible little fellow. As we sheltered, I realised we were at the part of the park where there is a fence which separates the two parts of the park. It was here you could walk across a massive wooden footbridge, which connected the two parts of the old Cefn Onn station. Well, I call it a station but in reality it was no more than a Halt. It was too small to take a whole train and in the latter years of its life passengers were asked to sit in a particular section of the train to avoid stepping into thin air as you got off. I noticed on the upward journey that the old wooden bridge is no more, but the massive stone support columns still stand majestically in the cutting where the old station used to be. In the background to this picture you can see the tall columns…but the bridge is no more! 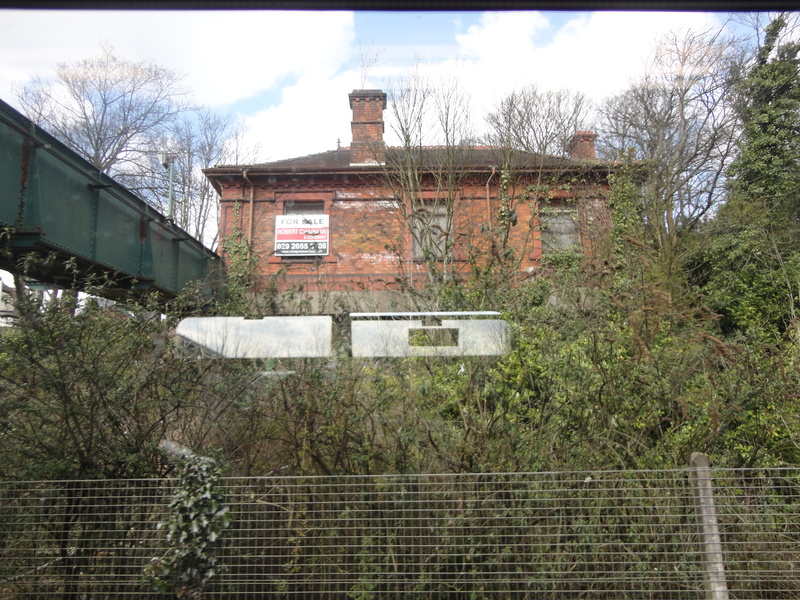 We ventured out to see if we could see anything of the old bridge or the magical little station, now left to ruin. A large metal fence barred our way, but I could look through at where the bridge was. To the left was a pathway, which I often walked up to somewhere called the Graig, what the path lead to I cannot remember…but I do remember walking up there many times. This was an adventure for another day. As we walked back towards the park, I noticed an overgrown path, sloping down and remembered this was the old path to the station. 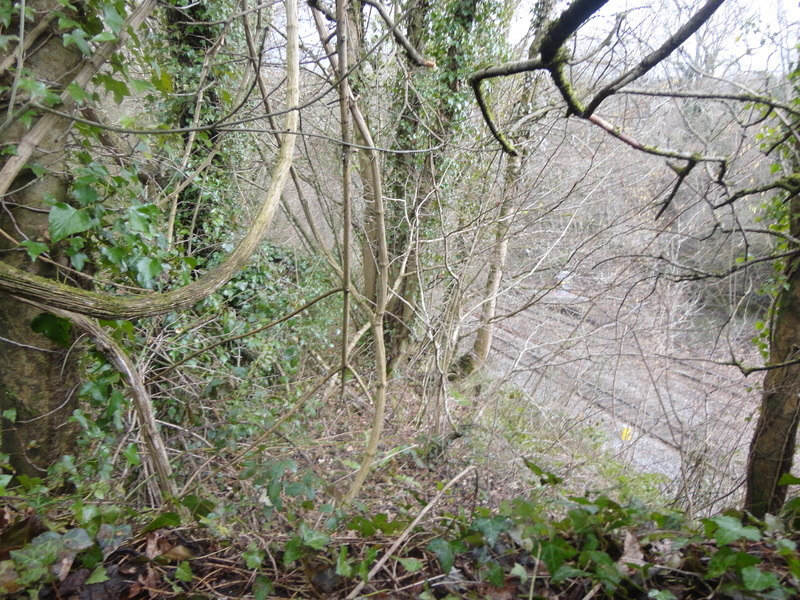 I longed to explore it and stand again on the small platform of Cefn Onn Halt, but I looked at the new pushchair, and then looked at the path, overgrown with brambles and logs and looking decidedly muddy. Into my mind came the smiling face of the lady of the house. She has yet to use the new pushchair and the thought of me taking it home, covered in mud and snagged with brambles was too much and I knelt down next to Alfie and told him that this was an adventure I must tackle alone and on another day. Do you know how to keep the lady of the house smiling? I came across a lovely website when I got home, written by a fellow adventurer, here is an extract…. ‘Hidden in a deep, dark, and silent cutting and only accessible by foot, this tiny wayside stop was situated next to a one-mile long tunnel that took the railway under Caerphilly Mountain. The Rhymney Railway built the railway line in 1871 to provide a direct link into Cardiff for their 1858 Rhymney to Caerphilly line. During the construction of the 2,000-yard tunnel, many Irish navvies came to the district. Such was the suspicion that Fenians (a secret Irish nationalist group) were lurking in their fold, that in October 1861, the group staying in Llanishen were guarded all night by armed police who expected insurrection. 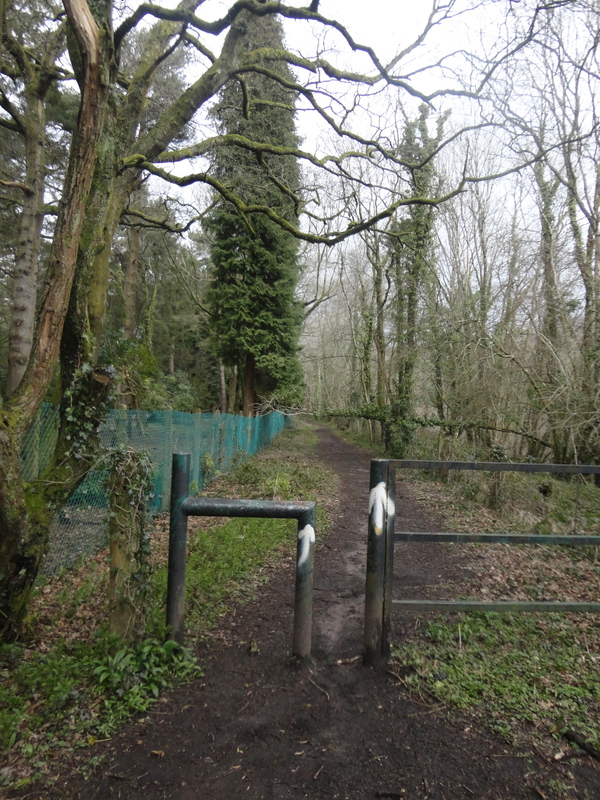 Cefn Onn Halt was opened by the Great Western Railway to serve the 160-acre wooded area known as Cefn-Onn Country Park (curiously, the halt was known as ‘Cefn On Halt’ until British Rail returned the missing letter ‘n’ back in the 1960s). Created by Llanishen resident Mr. Prosser, a former Manager of the Old Taff Vale Railway, the woodland valley park offers a rich selection of flora including beds of azaleas and rhododendrons, several varieties of magnolias, oaks and Acers, Chinese Witch Hazel), flowering Mahonias, bamboo, conifers and unusual evergreens like Nothofagus, Eucalyptus niphophila (Snow Gum). I can’t wait to go there myself…soon, very soon. The rain came on heavier so Alfie and I went back to shelter under the evergreens. Some pretty young mums who had brought their little darlings and their dogs into the park for some fresh air soon joined us. We exchanged pleasantries and they made a fuss of Alfie before moving on. They didn’t make a fuss of me, but that was fine – I was deep in my thoughts of when I could come back and plough through the unknown and find the long lost treasure of Cefn Onn Halt. As the rain eased off we made our way up to the pond, the final destination of today’s adventure. I found it… it looked so much smaller than it did when I was a little kid… but just being there was enough. We used to pass the pond and climb a steep slope which led to a grassy field next to the gold course. There was a cafe there and we would buy a tray of tea on a hot summer’s day. The falling rain meant our stay was a short one. It was time to go home. 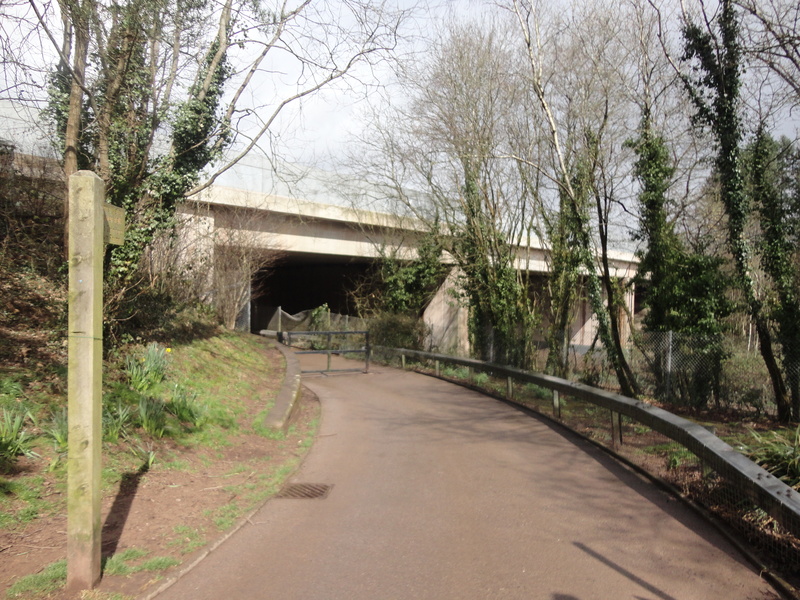 We made our way thoughtfully back, through the park, under the M4 and back to the station. I thought how modern and unromantic this one was. 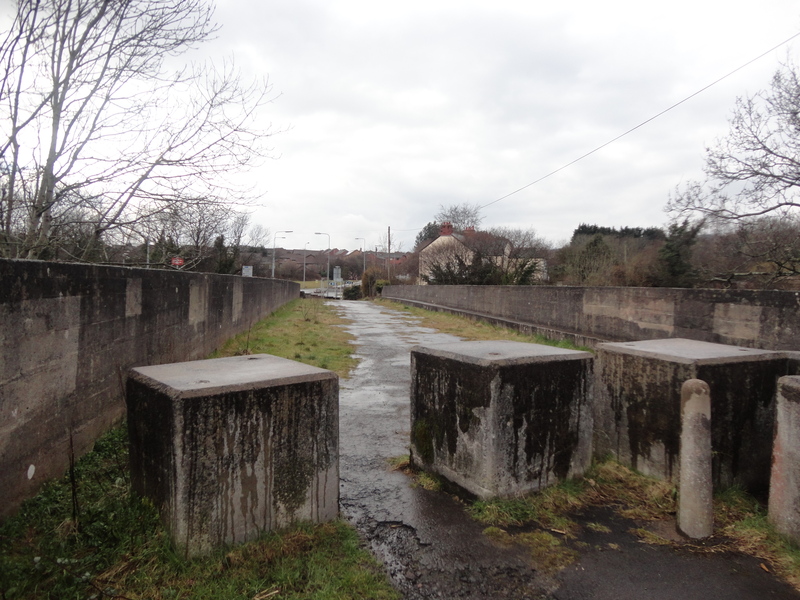 As we neared the station I noticed the old road and bridge stood beside the new one. It is now unused but a reminder of how this little country area has changed over the years. 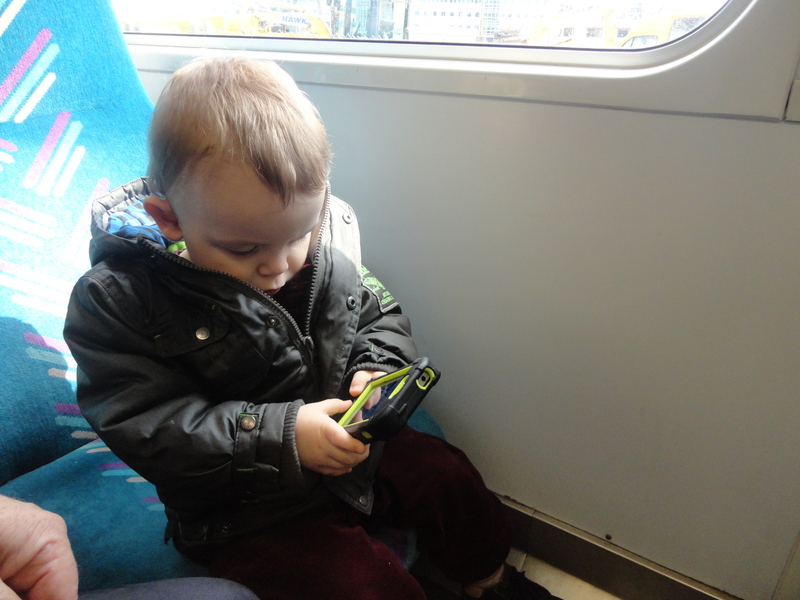 Alfie played quietly with my phone on the journey home, it is frightening how good he is already at unlocking it, but he hasn’t learnt my password yet but busily tried all the numbers! I looked down at Alfie and promised that I too would do my best to ensure that he and the Princess Mia and the little angel we call Millie would have a childhood filled with wonderful memories. It’s a big challenge, but it’s a challenge I accept. 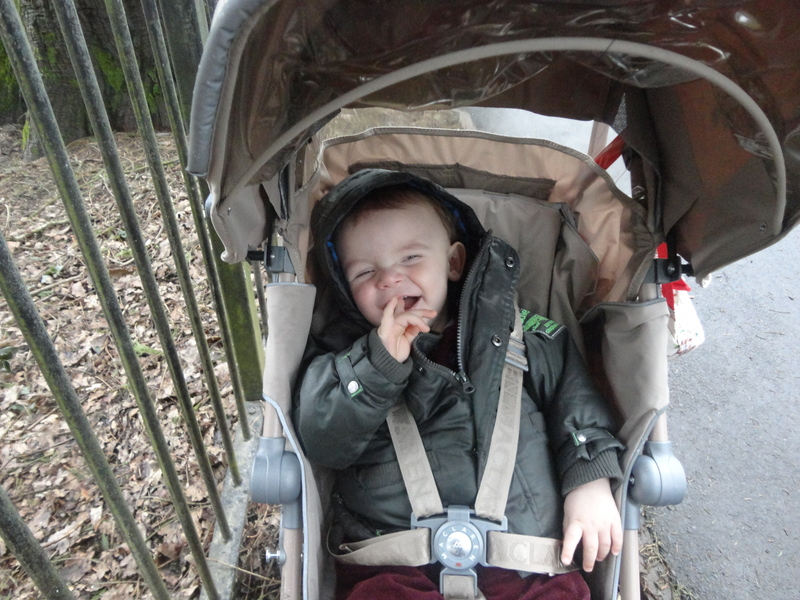 Alfie smiled… today had been a good day! Simple changes to buying habits can save pensioners money on their everyday bills and help them to claw back cash on luxuries. Roger Newberry, 62, a retired primary school teacher from Dinas Powys near Cardiff, lives adequately on his workplace pension, but has three years before he can claim the state pension. 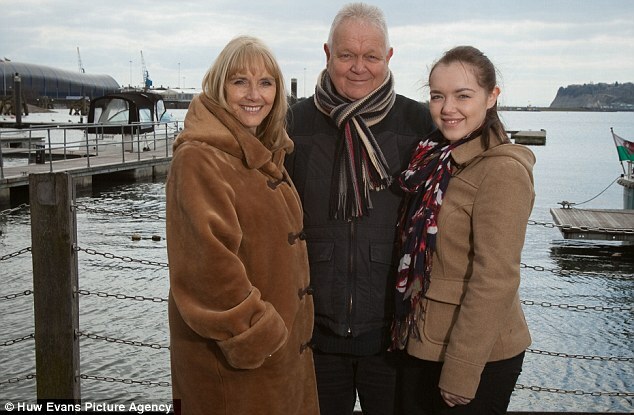 Roger and wife Jean, 58, who have three grown-up children, try to save as much as they can on bills and everyday costs to plug this time gap. Roger has also received cash back on travel – receiving a small chunk of money for flights to Iceland found via Quidco. 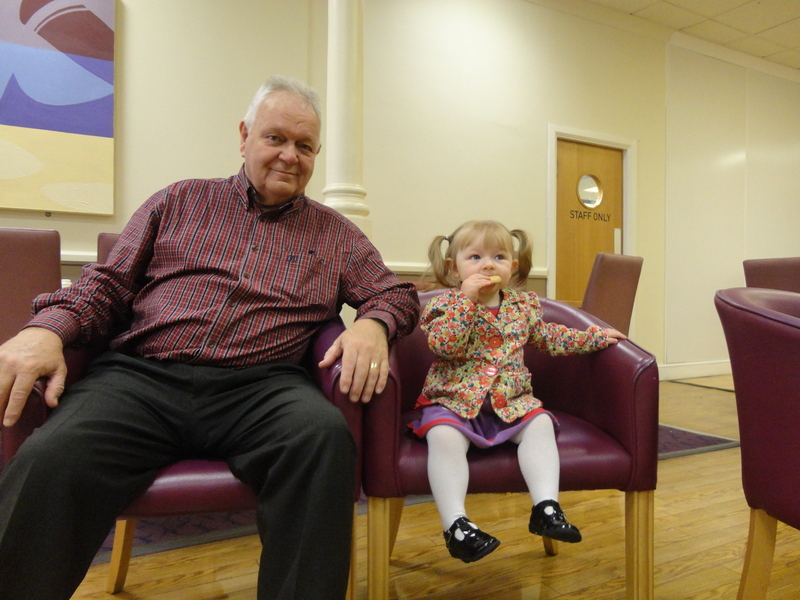 In total, he has boosted his pension income by £500 from purchases made via the website. He also uses MoneySavingExpert and various comparison websites to save money and says he is likely to have saved thousands of pounds in just a couple of years. Using comparison websites such as MoneySupermarket and GoCompare, to check prices and rates on anything from energy tariffs to savings accounts, in conjunction with cash back websites such as Quidco and TopCashBack, can save and earn people a small fortune each year. Using discount codes from Vouchercodes and Vouchercloud, for example, or offers from Groupon and Wowcher also trims the expense of treats and dining out. Alfie’s dad and mum wanted a day in London to round off their Easter break… this was encouraging news, as it meant I got to look after Alfie even though it was a school holiday. He stayed overnight which was great although it meant the lady of the house once again deserting the marital bed to look after him in the nursery. I am sure the sacrifice was worth it. The house was busy this morning with Aunt Bes being picked up early to join the excursion to London. The lady of the house gave Alfie a drink early on but Alfie wasn’t that keen on his breakfast, I don’t think he was feeling that great, but the prospect of a day adventuring was something to look forward to. A warm Welsh welcome awaits you in Merthyr Tydfil. Merthyr Tydfil is supposed to be one of the most historically fascinating and beautiful regions of Wales and is ideally placed between Brecon Beacons National Park and Cardiff the Welsh capital. A fifth of the County Borough lies within the Brecon Beacons National Park. Merthyr Tydfil boasts some dramatic and breathtaking scenery. As one of the towns forming the Heads of the Valleys, Merthyr Tydfil is rich in culture, landscape and scenery. Once the Iron capital of the world, Merthyr Tydfil breathes life into its history with attractions such as Cyfarthfa Park, Joseph Parry’s cottage and The Brecon Mountain Railway. Taking the train from outside my door to Merthyr, non-stop is something I have always wanted to do and today was as good a day as any. It was still quite cold so Alfie and I had to wrap up warm. 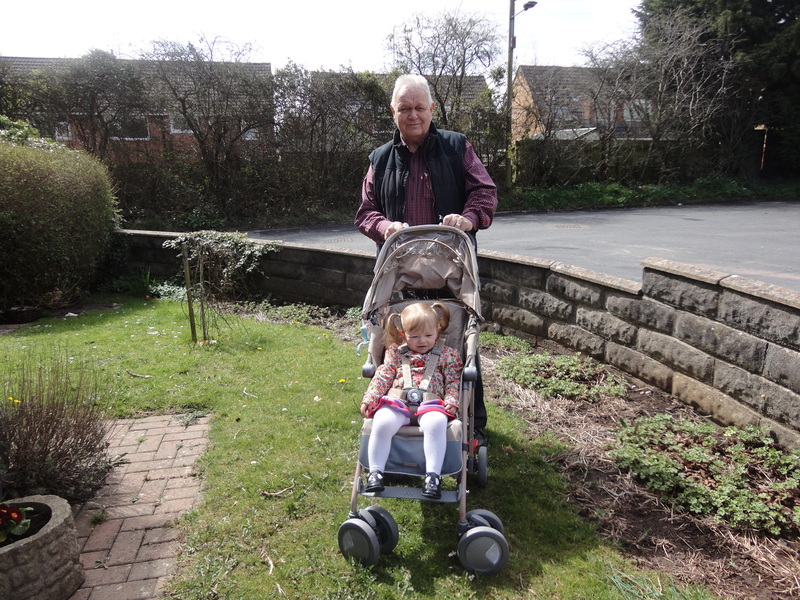 The good news was that I was able to use the new pushchair, Easyjet had ruined our other one – the garish pink one, on the way back from Disneyland Paris a couple of weeks ago and had sent us a new one – a top of the range Maclaren, I half expected Lewis Hamilton to be driving it when it came, so I felt really good on its maiden journey. It came equipped with suspension and a seat I could recline and it was easy to fold with one hand. I think Robert Louis Stephenson wrote it – I prefer it to Treasure Island anyway. I think you are supposed to read in in the rhythm of a train belting over the tracks. 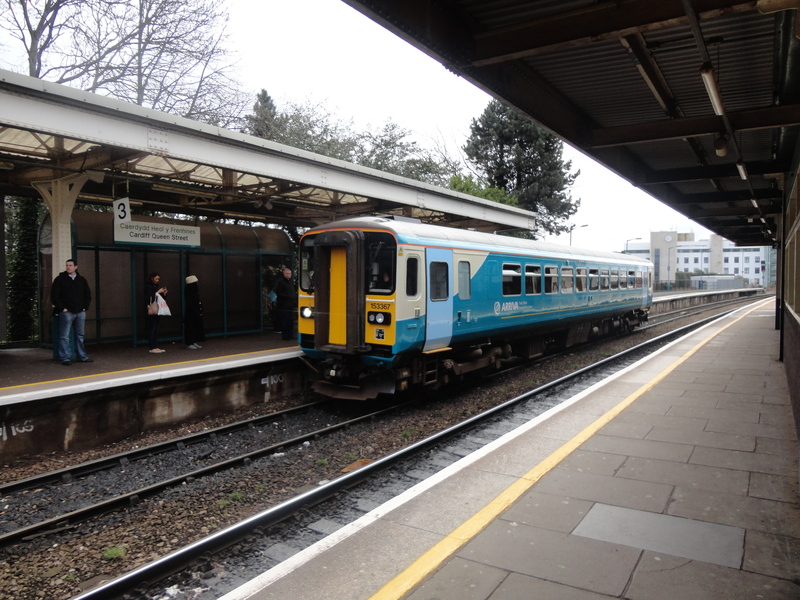 The journey was so interesting, into Cardiff then branch off after Queen Street Station, which is undergoing renovation to Cathays, Llandaff, Radyr, Taffs Well and then up the Taff Valley to Pontypridd then on up to Merthyr. 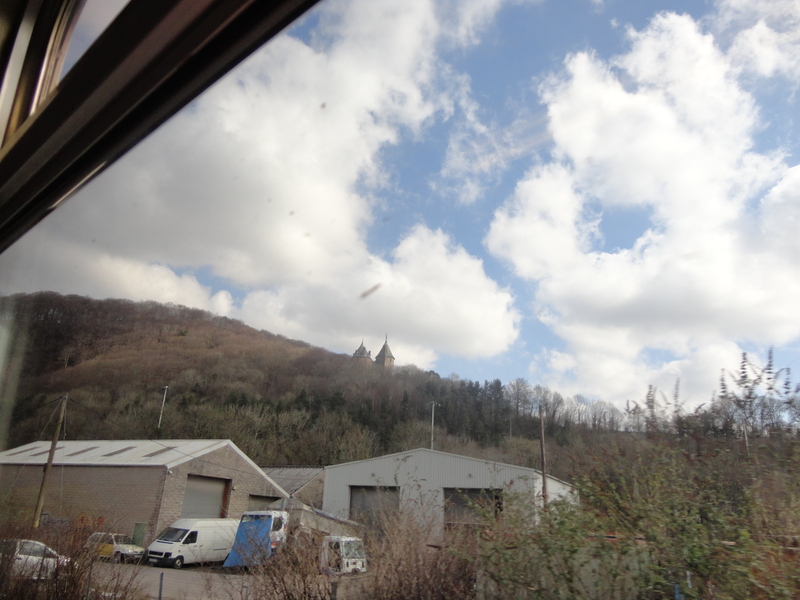 Near Taffs Well we passed Castell Coch – the fairy castle which always interests visitors to our home. The journey took and hour and a quarter and we both loved it. The track follows the river Taff virtually all the way. It’s the river that gives all true Welshmen the name Taffy – although I am sure it should only apply to those of us who live near this great river. It rises as two rivers in the Brecon Beacons — the Taf Fechan and the Taf Fawr — before joining to form the River Taff north of Merthyr Tydfil. 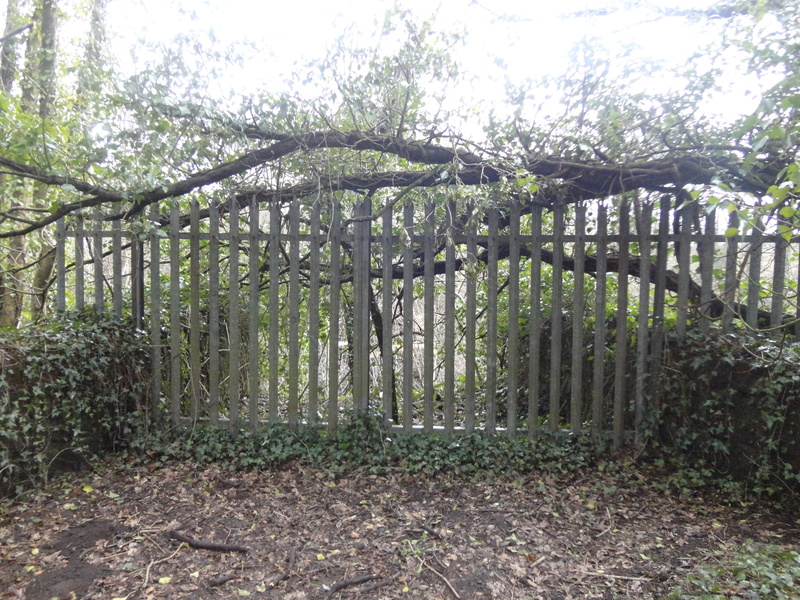 There was a huge weir just after Radyr Station with a massive tree, stuck in the middle. Crowds of kids were playing nearby. 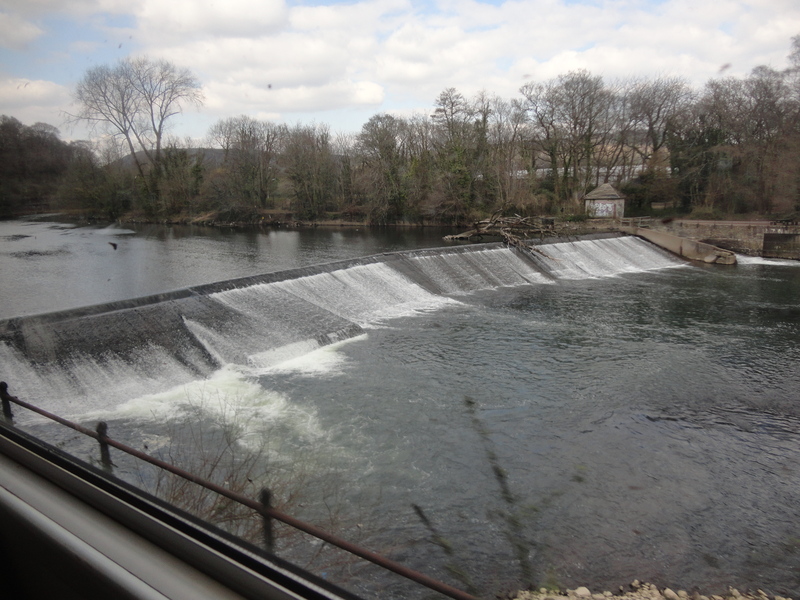 As we neared Merthyr, we passed Quakers Yard station. 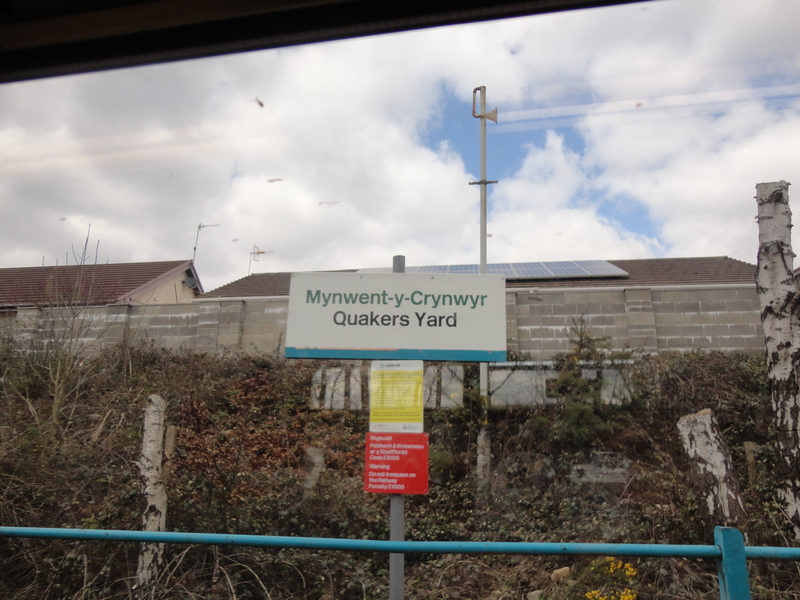 I never really got that name – Quakers Yard is a village just passed Abercynon. 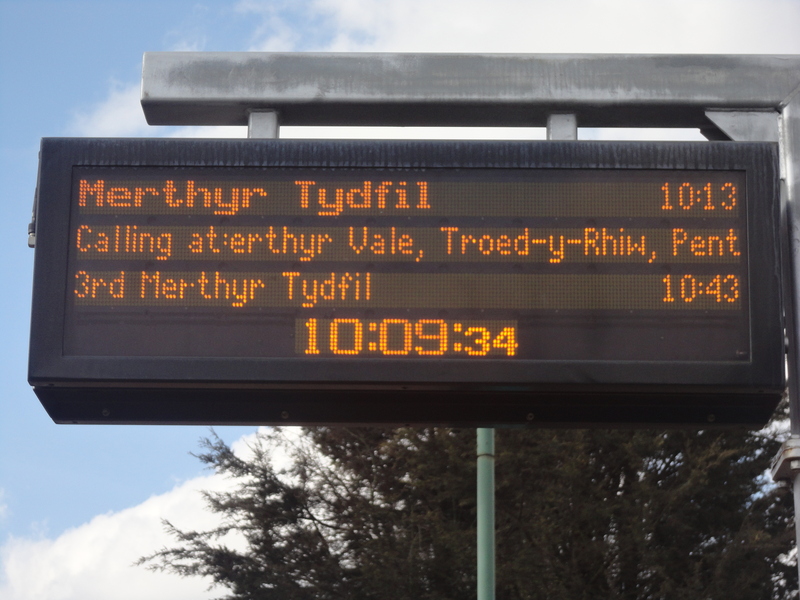 I noticed though that the station sign is Mynwent Y Crynwyr. ‘Mynwent’ means graveyard in English so it seems like this place was a burial ground for Quakers…Hmmm… I must look further into this and have a bowl of porridge while I do so! As we approached Merthyr there was still snow on top of the mountains. I was pensive and thought of the hundreds of thousands of coal trucks that had travelled down this line over many years. Coal had made Cardiff the great city it is today. Now, part of the line is just a single track, with a train running every half hour. It is all so different these days. I looked at the mountains, now green and beautiful whereas when I was a bit younger the South Wales Valleys were bleak, dirty, depressing places full of coal tips. If you look closely, you can see some of the hills are coal tips, which have been landscaped and are now green and pleasant. As we passed Aberfan I remembered that awful tragedy and how my brother and I went up to help in the rescue effort. It was a heartbreaking scene and my sixteenth birthday, October 21st 1966. I have much to share with Alfie, Mia and Millie when they are old enough to understand. We arrived in Merthyr at about 11.30 am and I was pleased to have made the trip and even more pleased that the train ran right into the heart of the town. 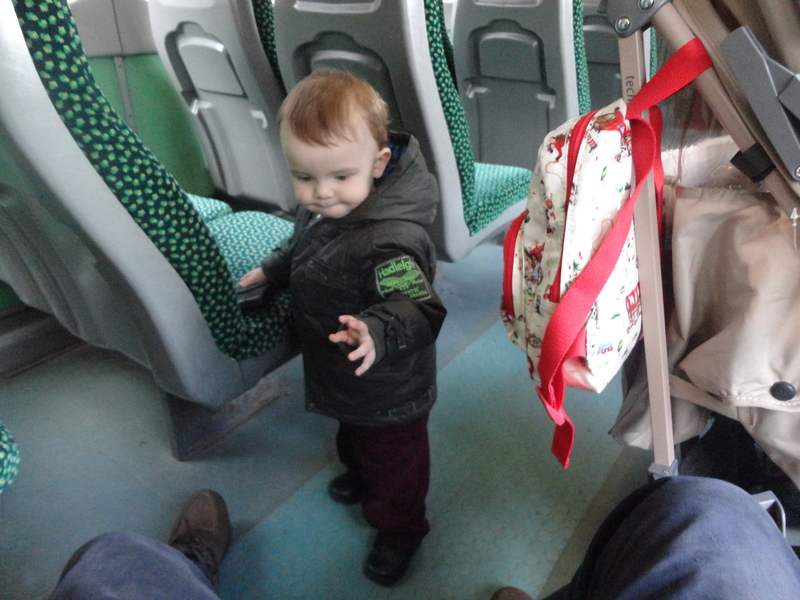 Alfie had been brilliant and had communicated well with all the passengers around him. Merthyr is a typical valley town… busy and friendly – but no M & S or other important store, but to my delight a great selection of charity shops – even more than Penarth! Alfie had dropped off to sleep as we got off the train so missed out on many of these delights. Merthyr was a friendly little place, it was cold but not as cold as the last few weeks, maybe Spring is eventually on the way. 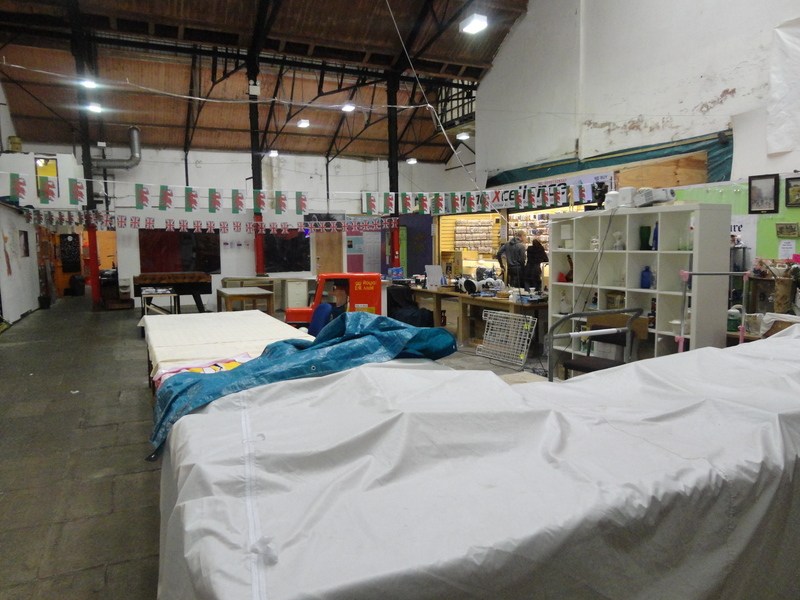 I found my way to the Indoor market, which had a range of stalls; it reminded me a bit of Pontypridd market, but the faggots were even more tempting here! 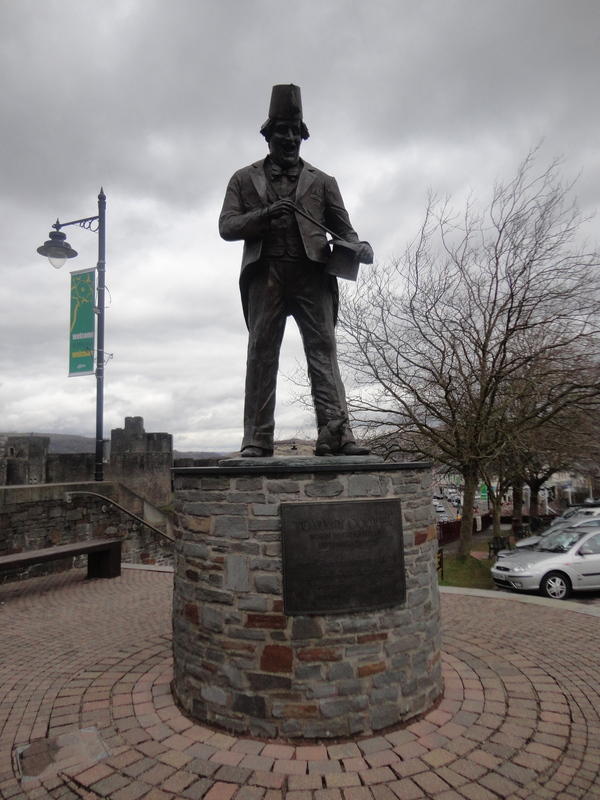 Merthyr seems to have been a big place for boxers and the town contains two statues to two famous boxers, Howard Winston and Johnny Owen. I remember the night Johnny Owen died, it was so very sad; he died in the ring, or just after the fight. I worked part time in Merthyr at the time, helping my brother out. He was manager of Merthyr Motor Auctions. The money came in handy when I was a struggling young teacher, looking back the lady of the house, Kate and Gaz hated me going. 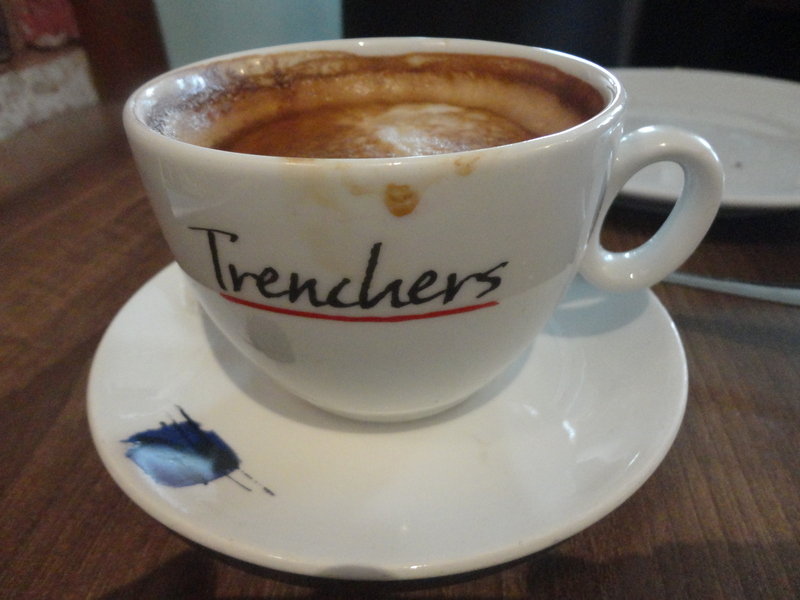 I had a cup of coffee and some toast in a little café by the station. 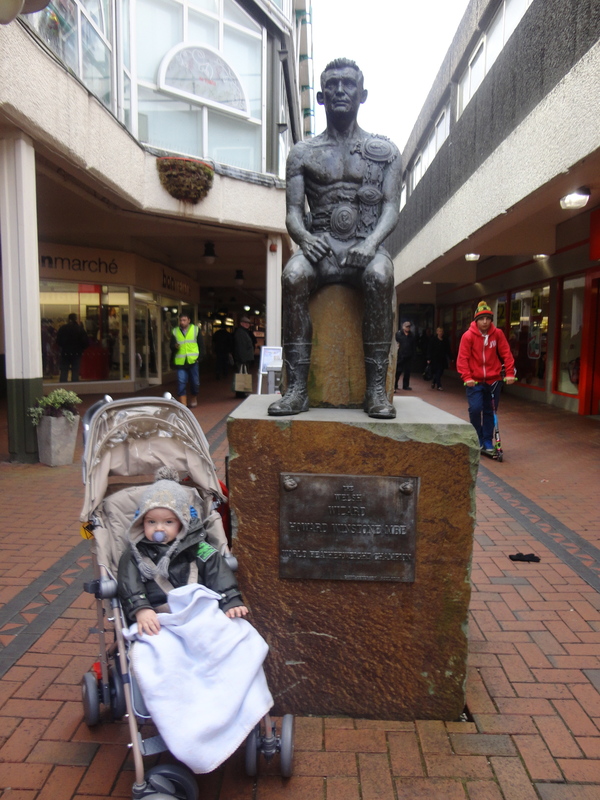 When Alfie woke up I took him around the town again just to have a look. He loved it and smiled at everyone he passed. 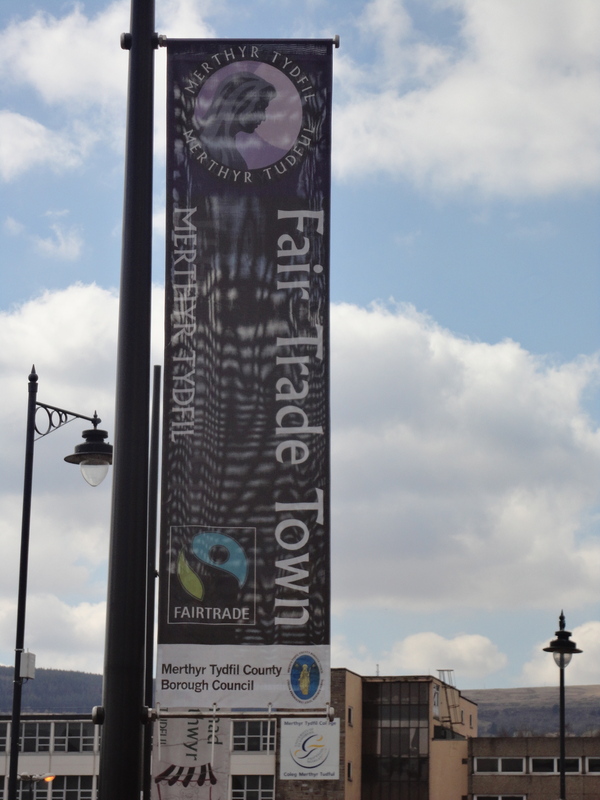 Merthyr is a Fair-trade town…good for everyone involved in setting that up. On the way home Alfie sat in the seat like a contented little old man all the way home, although at one time I thought we might not make it. 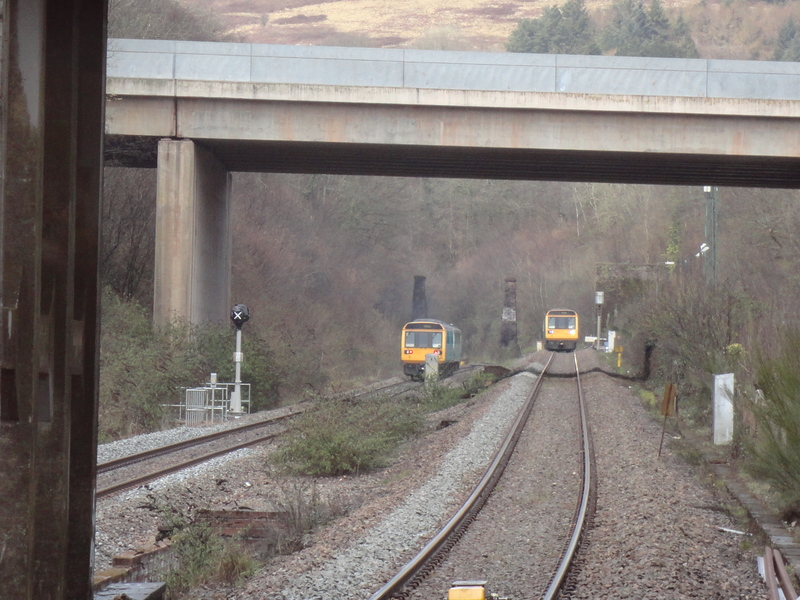 Just before Ynysowen (Merthyr Vale) Station, the train was travelling quite fast when there was an enormous BANG! A few of the people around us screamed and a little girl near us burst out crying. At almost the same time we passed a train coming the other way. The train ground to a halt very quickly indeed. I had to hold Alfie to stop him being shot forward. We all looked around not knowing what to think. The train was still for a few minutes before crawling into the station. When it did, the driver and the guard got out and inspected the train all around and underneath and made several calls on their phones. After a long wait we set off again and when the guard came to see our tickets, he told us that the train had hit a door which had been left lying on the tracks, probably left by vandals. That could have been very serious. Juts near Llandaff Station, we passed a derelict building my brother used to go to when he worked for some kind of charity – I must ask him what that was. I remember sleeping in the building on some occasions. The rest of the journey was uneventful and we arrived home tired but happy after a lovely adventure in the town named after a young lady who died too young. 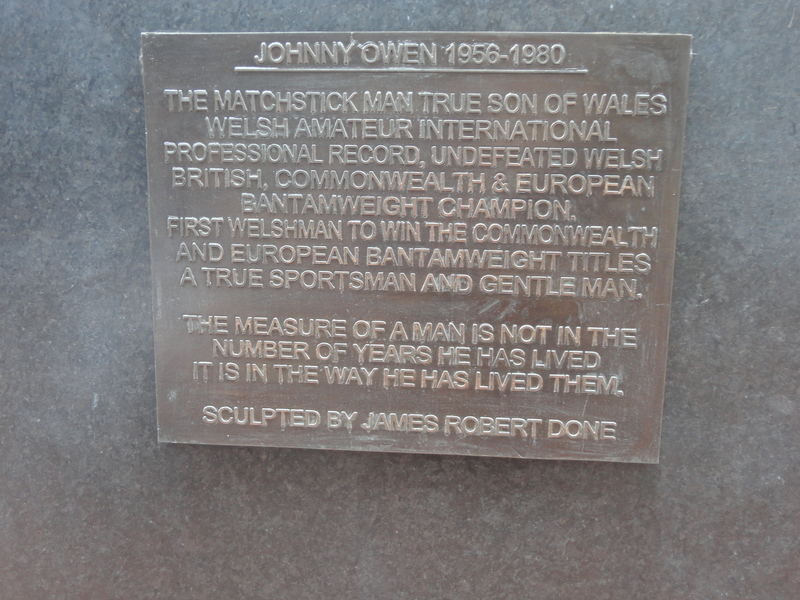 I will remember too the words on Johnny Owen’s statue.. The measure of a man is not the number of years he has lived…it is in the way he has lived them.